Nations at war demand retribution. Once called legends, now vile criminals. Chaos has struck. The furious battle against the nine classes has begun, and only one will be victorious. The strongest swordsmen have come to the task, and display their new colors so all others quiver in their chainmail. A war is here, and armies are rampaging. Only one shall survive. 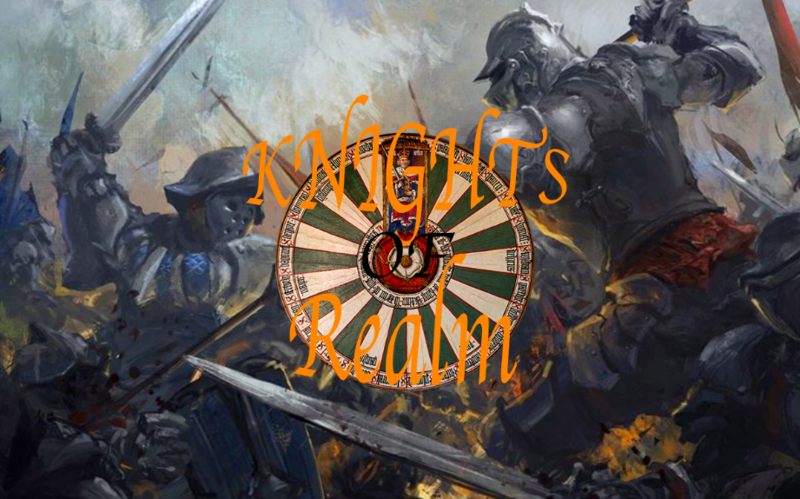 My expansion that I will be working on for some time is called Knights of the Realm! I've been thinking about this for awhile, and decided it's finally time to start my first custom expansion, so please I Hope you continue reading. Knights of the Realm is an expansion that introduces many chivalrous new minions and brave new combatants that are, well knights! The hero portrait you get with Pre-order. 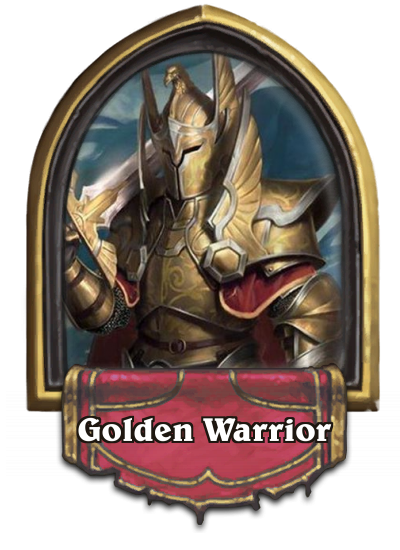 Famous knight, known for never revealing his true identity has joined the fight in Hearthstone as a customizable hero of the warrior class. the class cards is a little different Scroll Below to Find out. 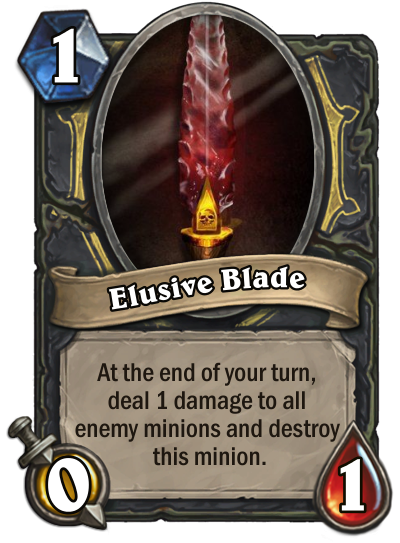 A Unique (that also is popular in swordsmanship terminology) technique that requires a number from the minion, like Overload, and performs an action. 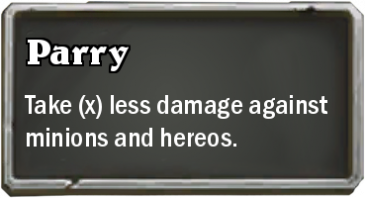 Minions with parry will take X less damage when getting attacked or attacking minions or heroes. 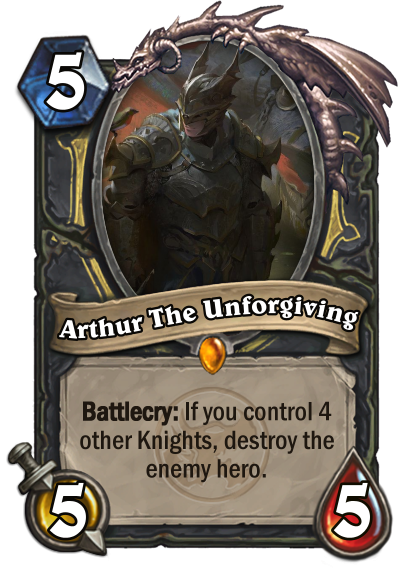 Justice, which is a usual word tied with knights, is more chivalrous, such as making the minion stronger against those who've killed his allies. 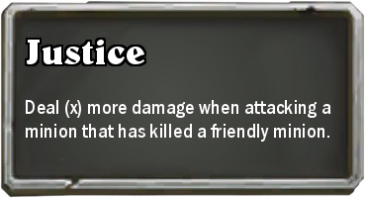 They deal X more damage against minions that have destroyed friendly minions, which requires planning when to use it, or even who to kill what with. 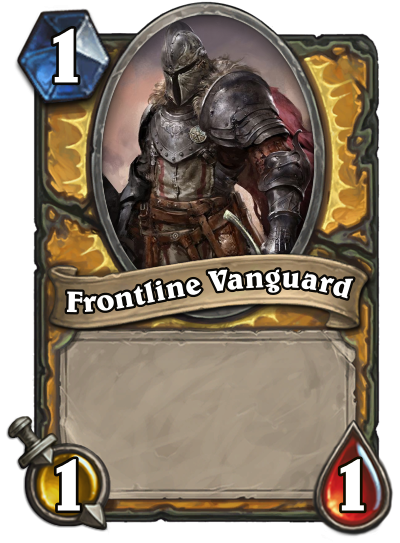 Both keywords play into each other, one is used for defense and the other offense, which I think really fits into the theme of the set. I will show off a few new cards today, seeing how it is the first day of my expansion. 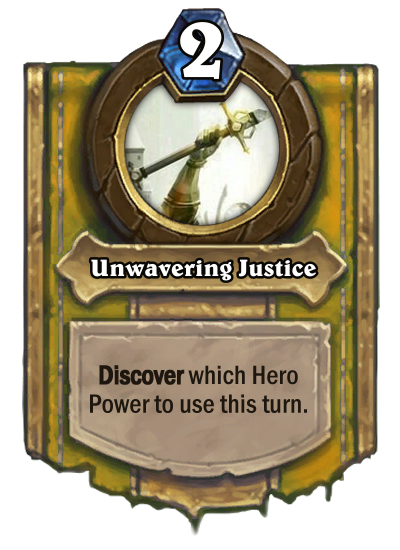 A Simple one drop that showcases the Justice mechanic, for example, it would deal 3 damage instead of 1 against a minion that has already killed a friendly minion. 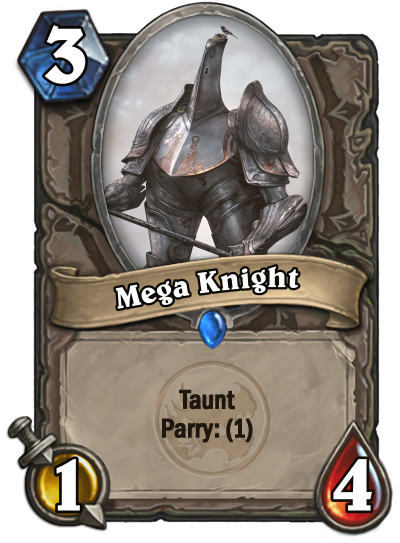 Mega Knight is a defensive minion that takes 1 less damage against other minions. Since it has taunt, minions must target it, it preserves itself on board even more for sustaining less damage than necessary. A Mace that gains an upgrade with Overload. In exchange for its higher cost, weaker attack and lower durability it gets a remarkable ability that can preserve it for many more rounds than just 3. 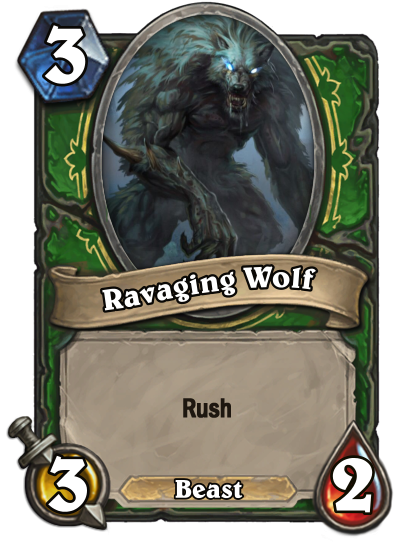 A simple draw card, they appear often in druid, however similar to Raiding Party, it draws the race Beasts instead of normal minions, which helps because it thins down the draw amount if your looking for a certain card. 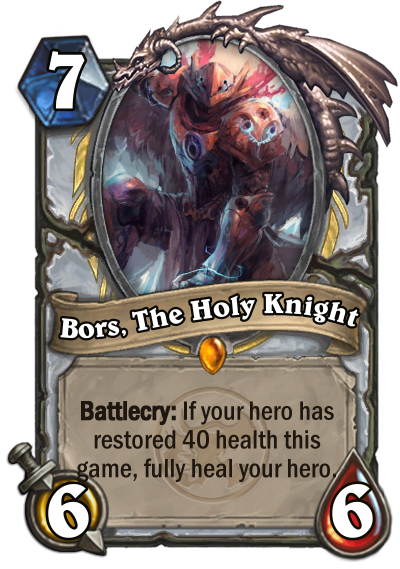 An angel from the heavens, here to fight for the priest class! Bors hold tremendous capabilities. In the case that your hero is under 5 health, you can fully regenerate, completely annihilating your opponent's plans. Even then, his stats are impressive, well enough to put up a fight against others. Beast tamer from the wildlands, said to be able to speak to all animals and control them at will. 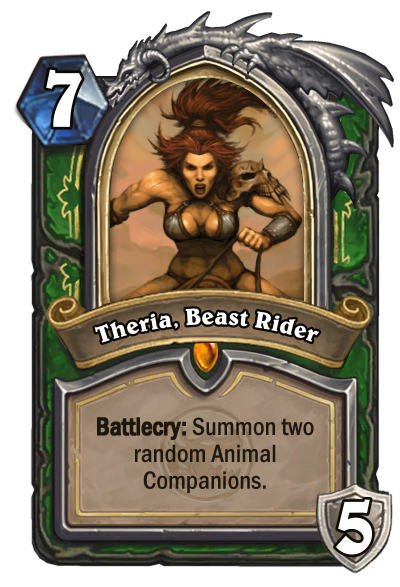 Theria is a major card for beast decks, considering that her hero power gives beasts 2+/2+. 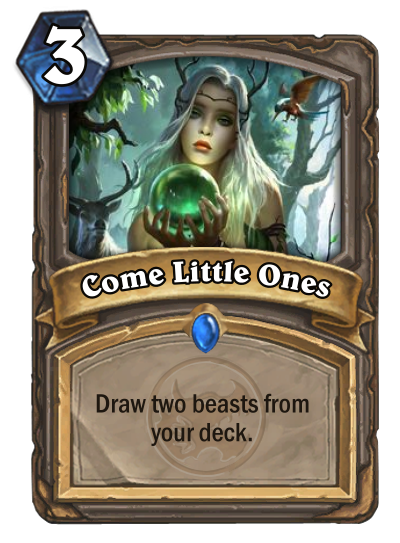 Similar to dinomancy, except you also get two animal companions with her being played. Thank you for reading! Even if you scrolled all the way down that's fine! Please leave an upvote if you enjoyed my post! Timer for card drop is above. The Latest Updates will always be at the bottom of the Thread, if you want to read my thoughts making this card. 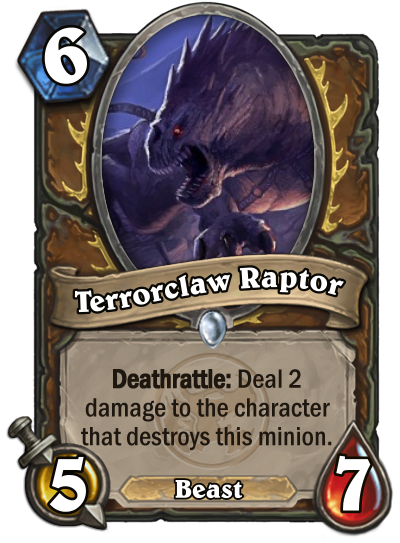 Terrorclaw Raptor- A big beast minion for druid, with a punish effect for minions that destroy it, works well into Beast Druid. 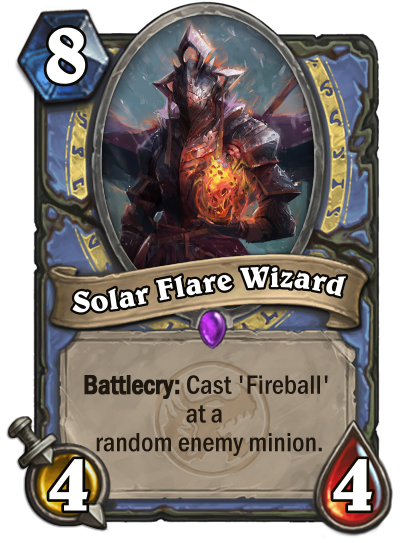 Solar Flare Wizard- Similar to Archmage Antonidas, however, it basically is deal 6 damage to a random minion. A different way of removal, that would be used in a tactical way. 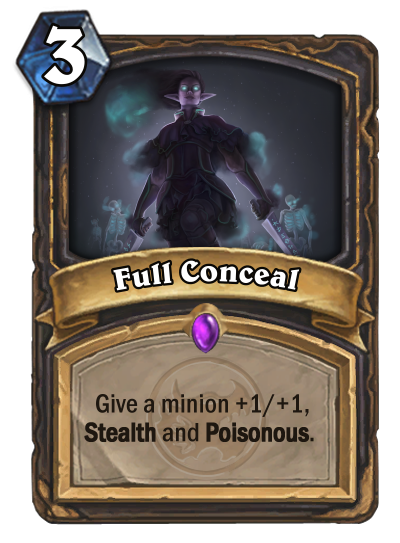 Full Conceal- Basically a spell that makes a minion go full assassin, waiting until the right moment to strike. 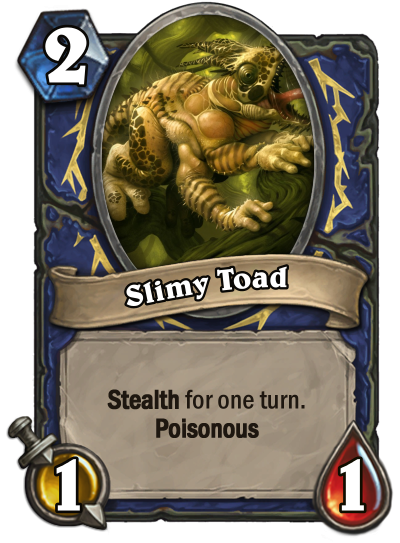 With Stealth and Poisonous, it can clear almost any minion. 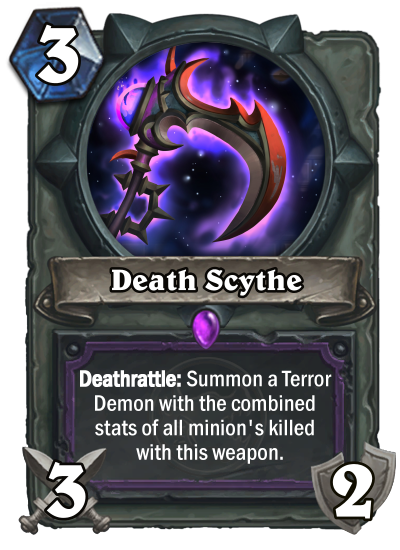 Death Scythe- Similar to the Death Knight Weapon, except it creates a single demon with the combined Health, Attack and Mana (Up to 10). It can be used in very interesting ways and removal, and also leaves a board presence. 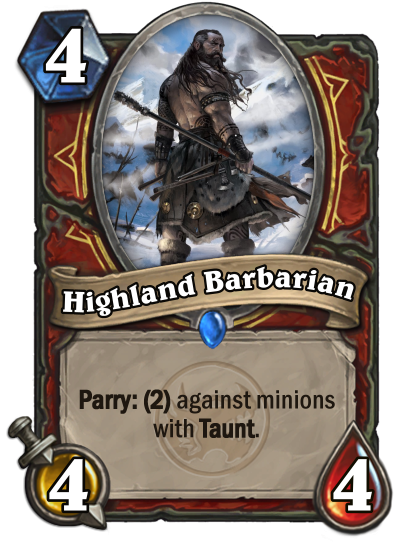 Highland Barbarian- A situational minion that works as an anti taunt technic. Defensive Tactics- A simple Warrior card, however useful for keeping a minion alive. 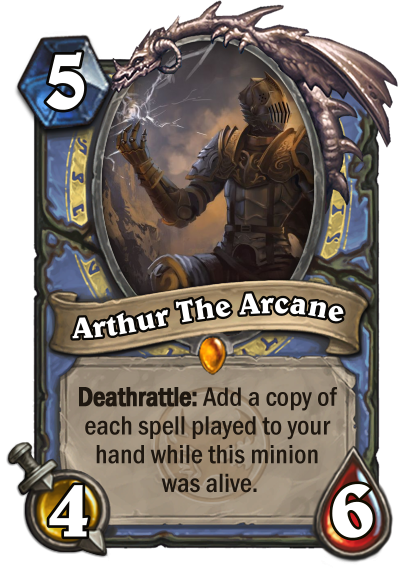 It can be used to stack Parry's, or even just to draw a card. None the less, it still is useful to include. 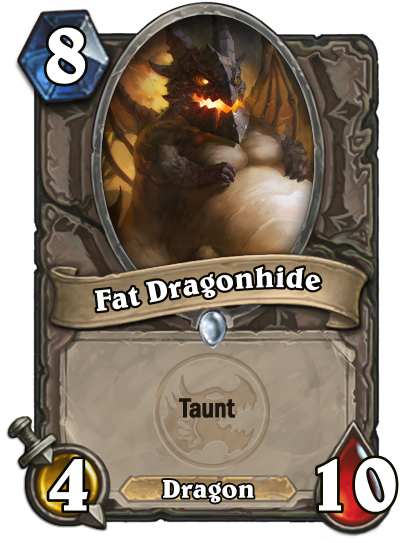 Fat Dragonhide- Similar to sleepy dragon, except at a lower mana cost for health. 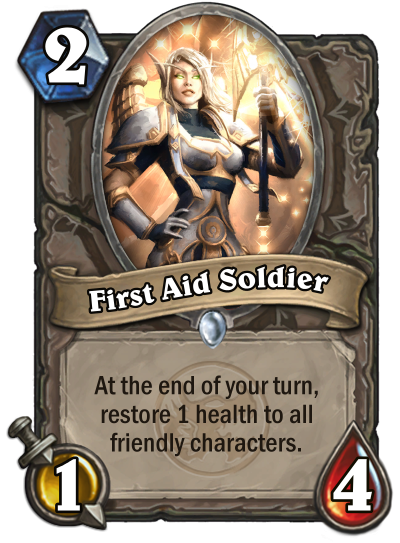 First Aid Soldier- good at keeping preservation on board, and a good early drop. 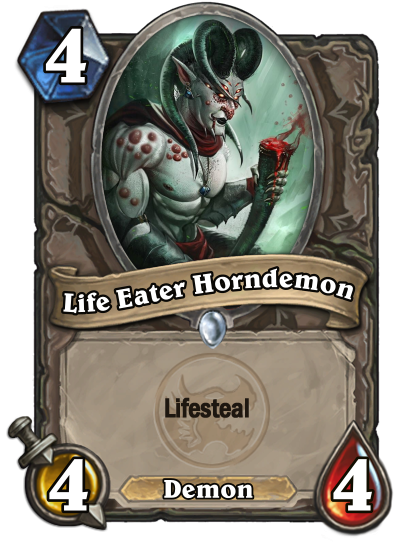 Life Eater Horndemon- Similar to Bloodworm, except part of the demon class. 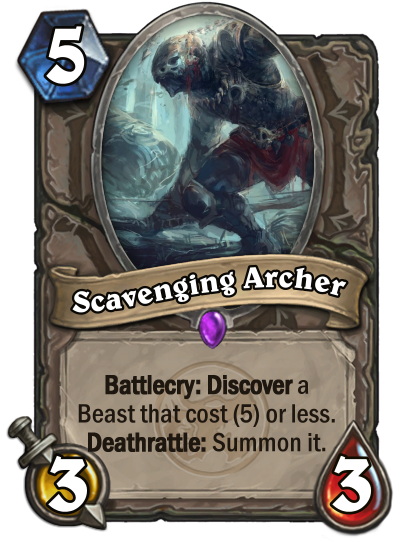 Scavenging Archer- Works well in board preservation, and especially fits well in classes like Rogue or Hunter. The beast can also be used with other synergetic cards. 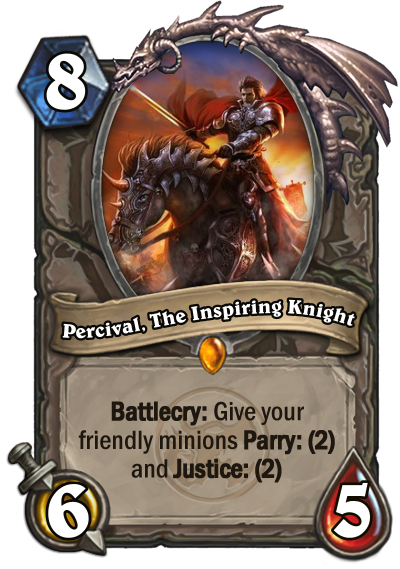 Percival, The Inspiring Knight- A card that utilizes the Parry and Justice technic, and really makes your board harder to deal with since its reduce damage intake and higher damage (if requirements are met.) 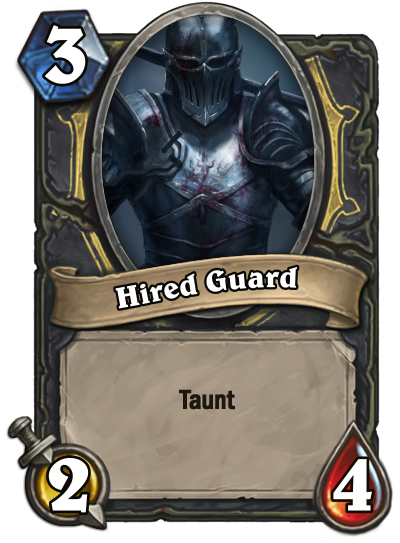 I think it fits well in aggressive or control decks that try to keep board presence and becomes a real hassle for your opponent. That's it for today, next card reveal date will be announced soon! 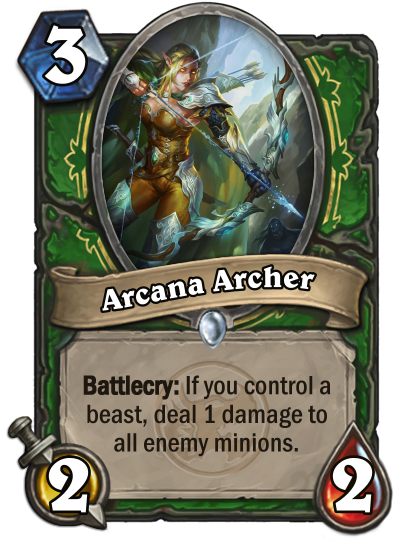 Arcana Archer: Similar to an Arcane Explosion Elven Archer, so why not use both in one, provided you have beast synergy. 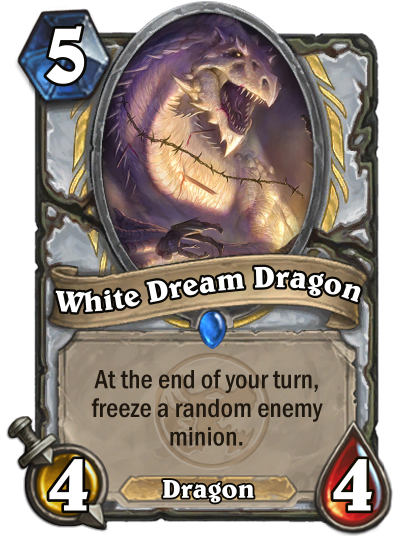 White Dream Dragon: A simple Dragon Worm creature that fits the control dragon theme of priest, which is a big style in the set. Degore, The Corrupt Knight: A card that can potentially be game-changing, in most scenarios he won't survive a single turn, but is good for that board damage. 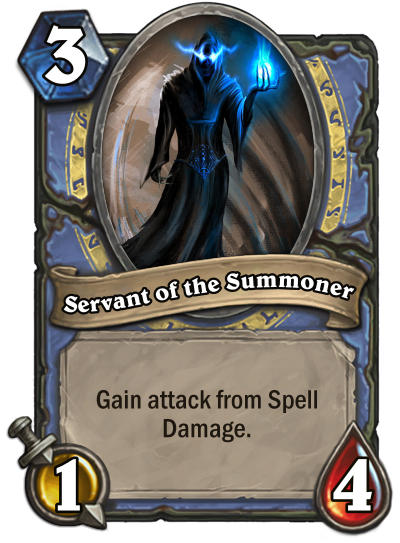 You may say there aren't many poisonous synergies, however, I plan on making Shaman revolve around a Poisonous theme for this fan set. 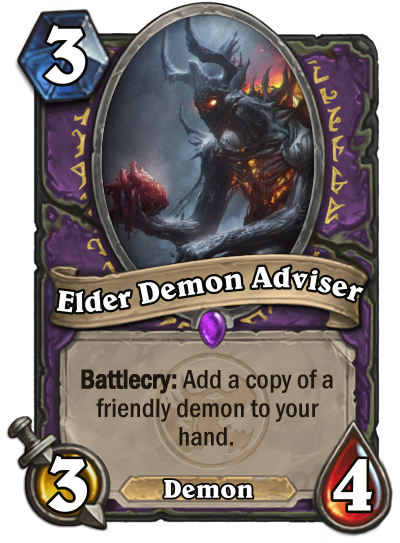 Elder Demon Adviser: Similar to Baleful Banker, except only for demons which isn't a big deal for warlock. 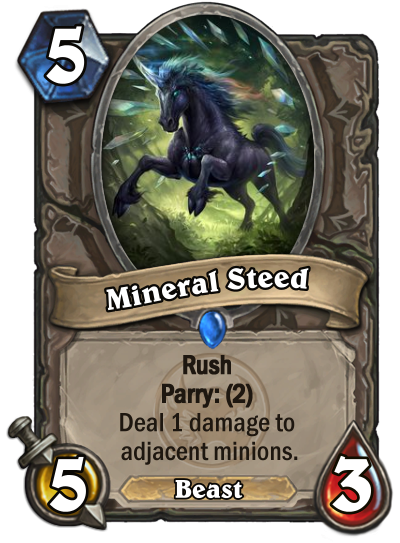 Mineral Steed: A good damage burst minion that can potentially get a 3 for 1 trade, and has survivability with it's included parry. Thanks for tuning in to the update! Next update on Monday! Arctic Witchress: Basically gives the effect of Blizzard to all of your spells. 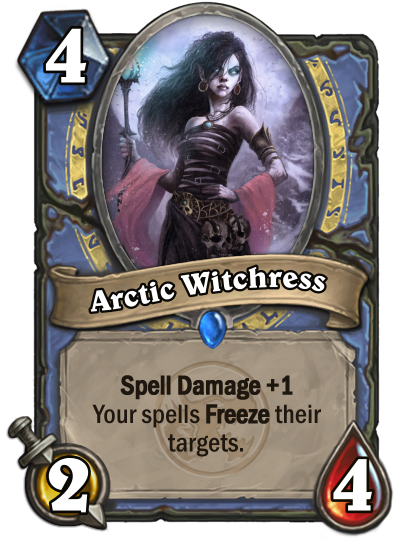 I was considering making a freezing minion for a while now, and I feel like the use of freezing with spells is surprisingly kind of original. 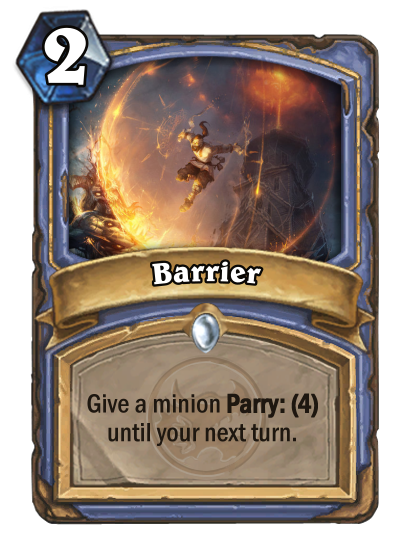 Barrier: Very simple, uses the new Parry mechanic to defend a minion, granting them near immunity in most cases at the early stage. It can also be used to take less damage when attacking. 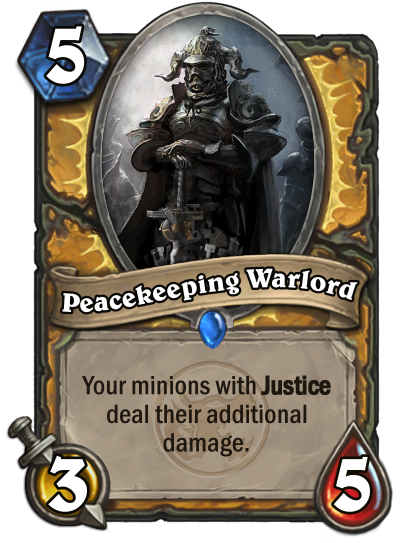 Peacekeeping Warlord: By what this text means is that if a minion has Justice, it will deal the damage to all minions and not just minions that have killed a friendly minion. It uses the mechanic in an interesting way and is a good way form of board strength. 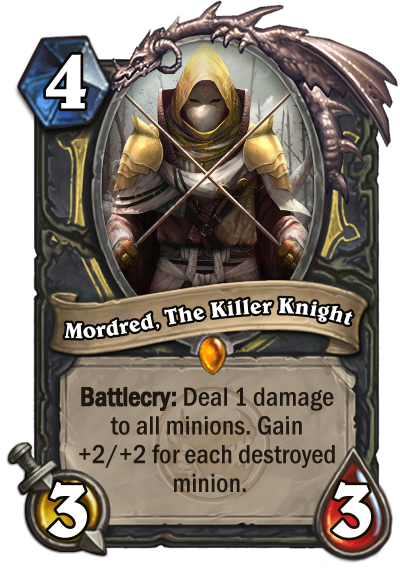 Mordred, The Killer Knight: I was thinking about Edwin VanCleef while making this, So I believe that it's fair. The +2/+2 can be strong early game, but it only depends on having the one damage kill others. 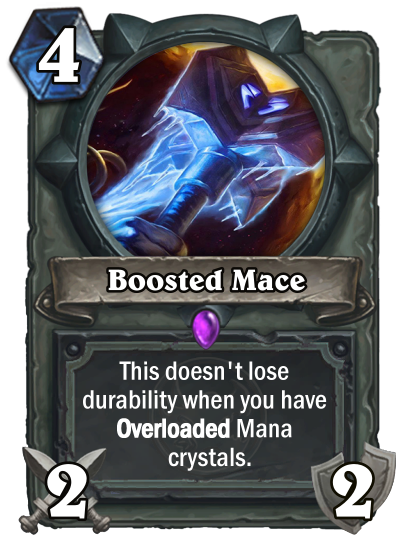 Similar to Overload except you don't need to deal more damage. 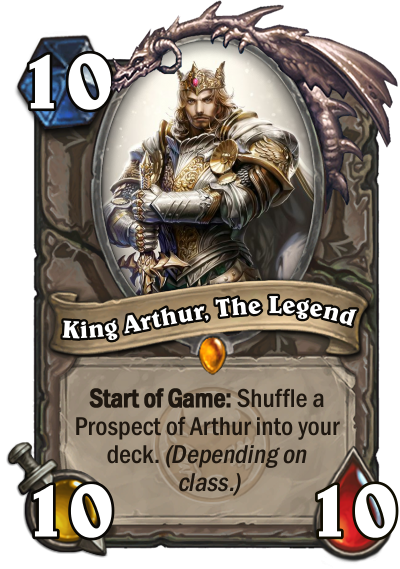 It's also very situational, being able to be an early game control method, board clear, or late-game pressure. 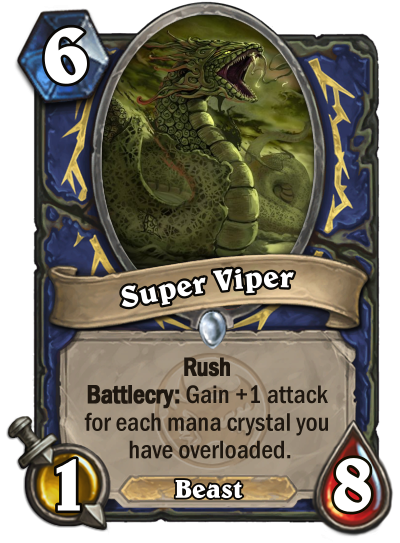 Super Viper: Utilizes the Overload and Rush mechanic, also this does count for your previous and current turn crystals. Usually, I can see it gaining 3-4 more attack, which is considerably good with its large health stat and Rush mechanic. Deviant Demonology: Very simple, it buffs your demons, cards we've seen in Warlock. Goblin Assassinator: I thought about a card like Elven Minstrel, except usable to all classes. The downside is, is that this is a deathrattle which means it could be silenced to prevent combos, but It's worth the draw a minion, especially in decks like Malygos. 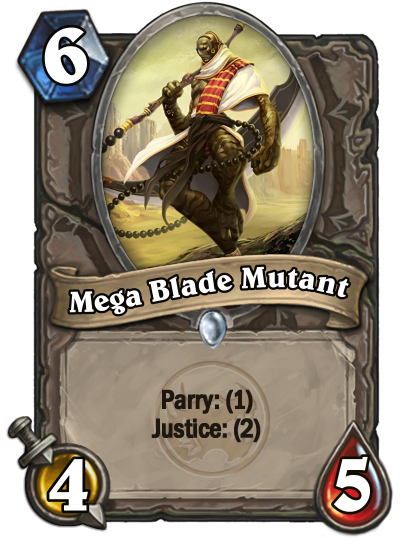 Mega Blade Mutant: Utilizes the Parry and Justice mechanic in a single card, your average mid game minion. Raging Barbarian: Similar to Rogue, it's a Warrior mechanic available to other classes and fits into Aggro type decks, getting rid of Roadblocks. That's all the cards for today, I appreciate everyone who's took the time to look through my work! Next update will probably be focused on Neutral cards, Date announced at a later time! Parry and Justice seem pretty boring when the only effect is increased/decreased damage. 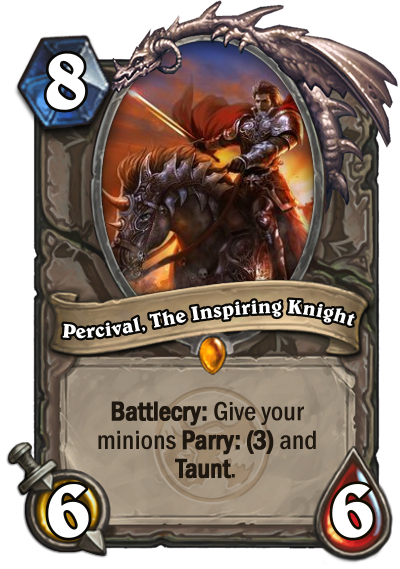 If it were me, I'd make it a more versatile keyword, so you could do things such as "Parry: draw a card". I also don't think it's a good idea to have two very similar keywords in the same set. Of the two, Parry is better. Bors is too strong. 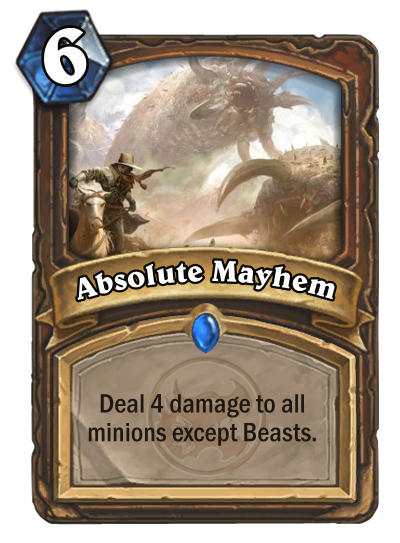 A 4/9 taunt for 6 is already really good, and that kind of statline usually comes with a condition. Adding on a full heal is insane and unfun. 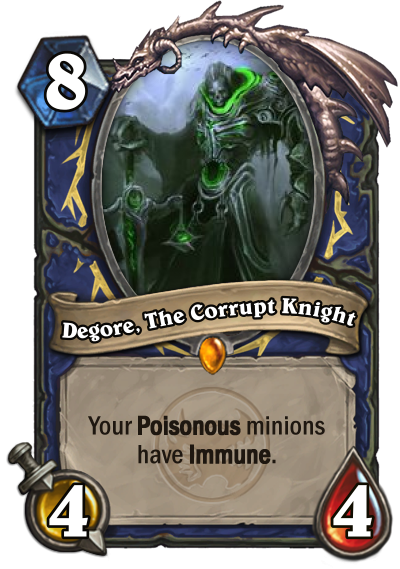 Degore is really weak, but if he somehow gets poisonous onto himself, he'll be permanently immune, which shouldn't happen. He needs a fundamental redesign, imo. 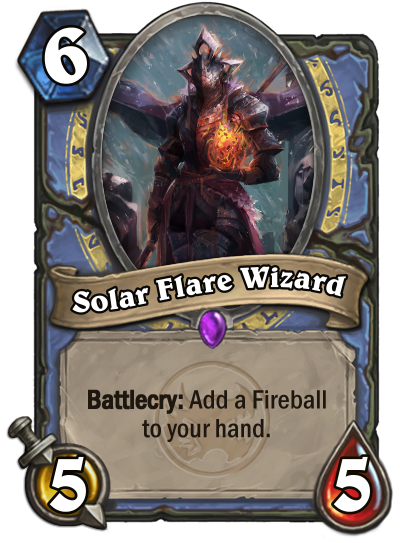 Solar Flare Wizard feels like it should just say "deal 6 damage" instead of "cast Fireball". Also, it seems very weak in comparison to Bomb Lobber. Death Scythe is VERY undercosted. A 3/2 for 3 weapon is the baseline: summoning a potential 8/8 isn't unreasonable, and should bump the cost to at least 5 or 6. 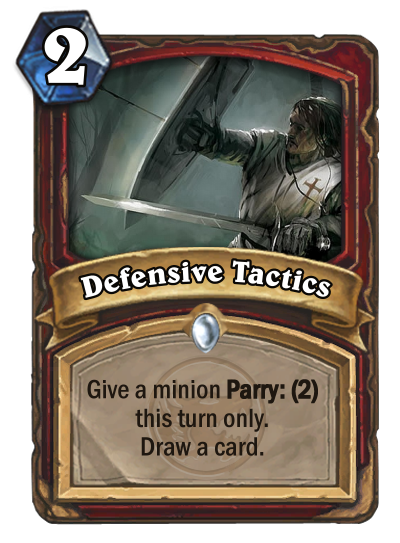 Defensive Tactics is, at best, "Heal a minion for 2 health and draw a card", which is a worse effect than Power Word: Shield, a 1-mana card. 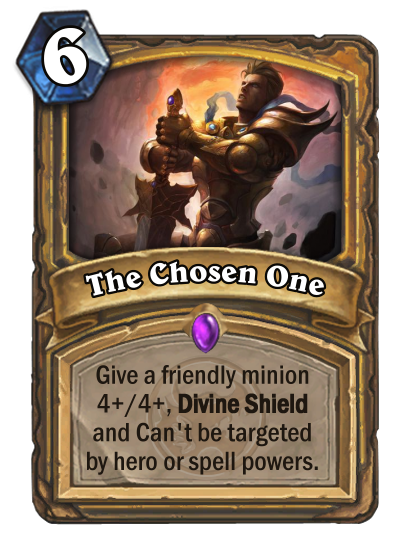 It also compares unfavorably to Potion of Heroism, the Paladin card. Deviant Demonology is wayyy too strong. 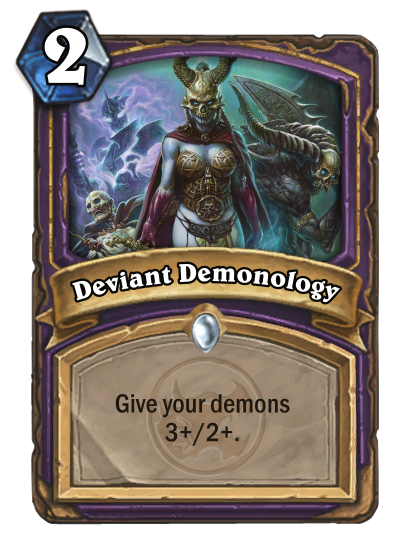 +3/+2 on a demon for 2 is pretty balanced, and maybe even too strong with Voidwalker as an opener. Doing it to your whole board is insane, especially when Bloodreaver Gul'dan exists. Your board of leftover voidwalkers from your Voidlords suddenly becomes yetis, for a 2-mana card. Way too strong. I'll also say that I think you're overestimating the power of Parry and Justice. 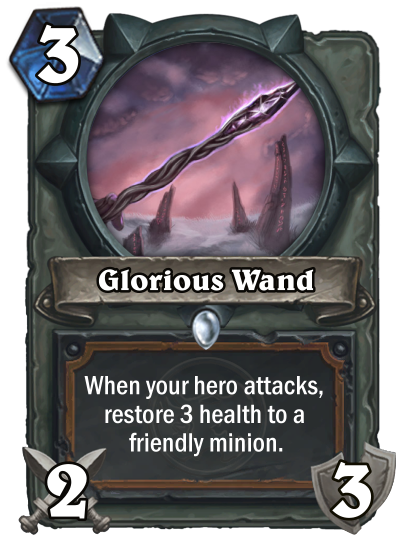 Almost every card with those keywords feels pretty weak. Overall, there are a lot of good ideas here, lots of solid flavor and fun ideas. Keep up the good work! 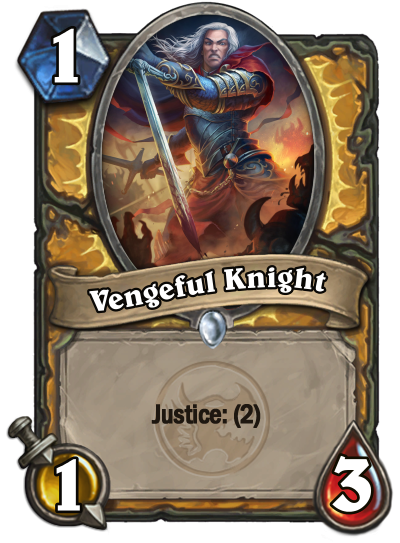 I think Vengeful Knight is fine. It has the Justice tag, not Parry. Pretty sure flame imp would kill it just fine in a single attack unless I'm missing something. For clarification, Parry is like an infinite point of health. if a minion had Parry: (1) and a one attack minion attacked it, it would not recieve any damage at all. 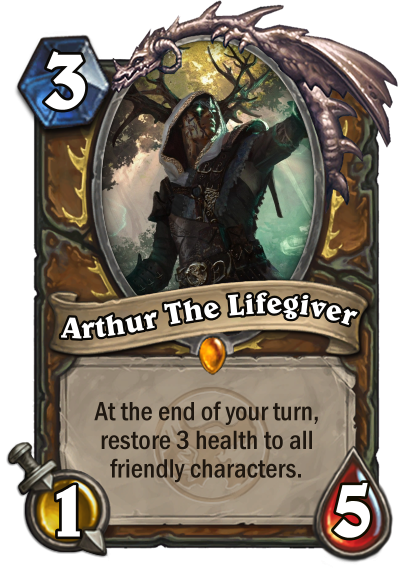 It's why I consider it should cost more than cards that add health, because they are only one time things unless a minion is healed up, while Parry is permanent. Justice doesn't take mana because it requires a semi difficult, it only adds attack against minions that've destroyed a friendly. This means it's sort of like a revenge tactic, which is why it won't really work against cards that are meant to trade, and work best against bigger minions that are meant to control the board. 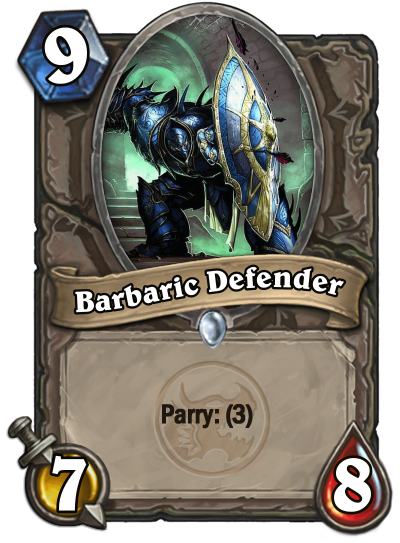 Barbaric Defender: Your standard larger minion of the neutral set except the Defender has a decently high Parry stat, making it good at surviving on board. Ghastly Warlock: After making Goblin Assassinator (Scroll Above to see) I feel like it was only fit to make the counterpart. 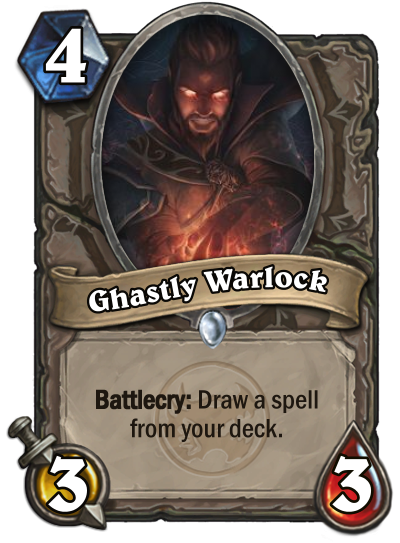 However, spell draw is slightly more rare in decks, so I found it fitting to make this a guaranteed effect at 1 more mana. 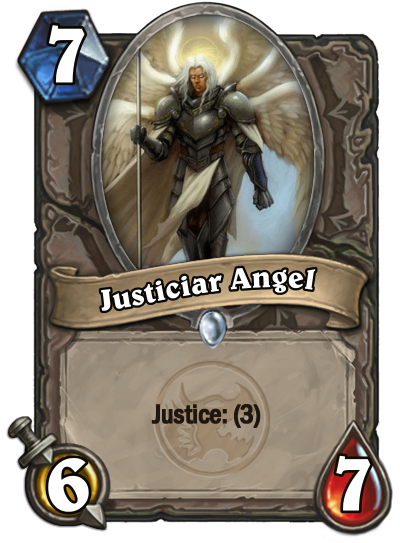 Justiciar Angel: Similar to Barbaric Defender, a bigger minion that is more focused on the Justice mechanic. It's justice stat is decently high at 3, which makes this minion a good Punisher. 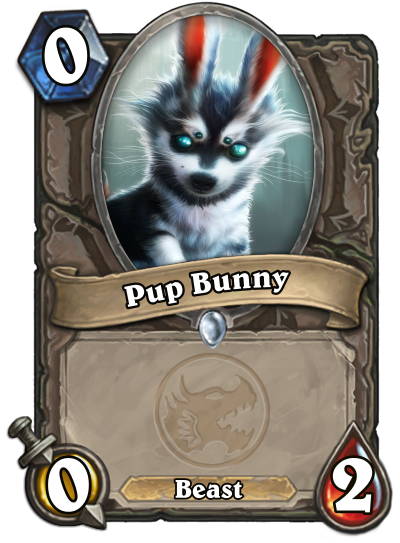 Pup Bunny: Cute card. Sue me. 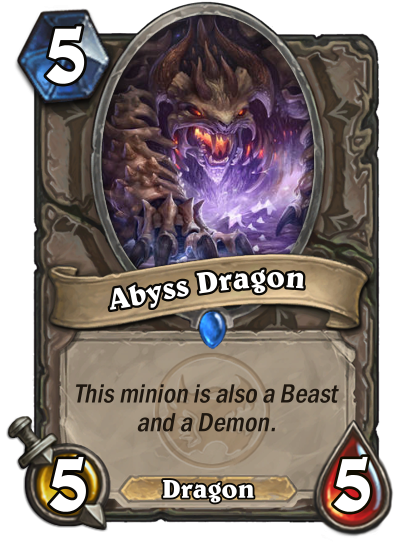 Abyss Dragon: Similar to Nightmare Amalgam, however, it only is a Beast and a Demon besides Dragon. 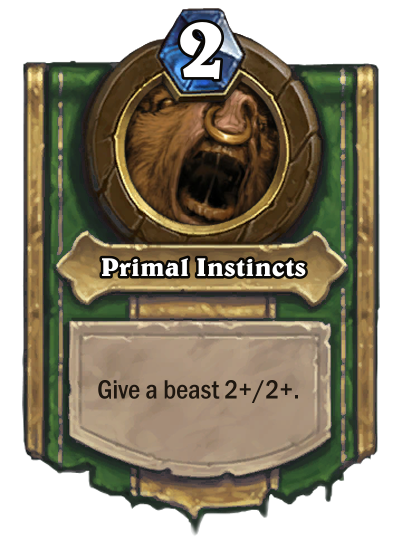 The tag provides flexibility in decks and can fit into different styles such as Beast hunter or Dragon Priest. 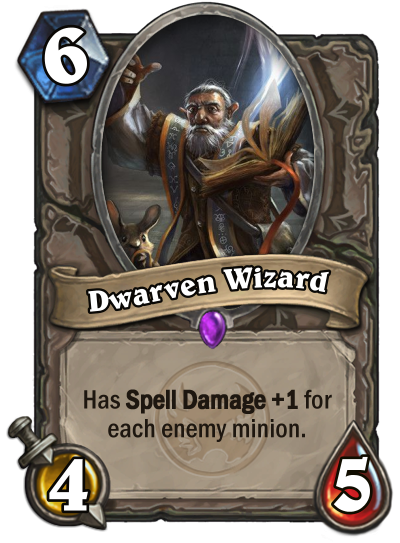 Dwarven Wizard: I wanted to play around with the Spell Damage ability, so in some cases, this dwarf can have more spell damage than Malygos, and in others, he could have just enough to clear the board. The high mana cost is good since rarely there will be an opportunity when you can play a big spell with this card, leaving your opponent some time to make a change. 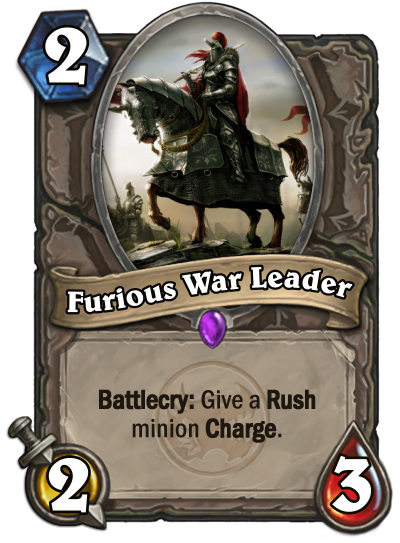 Furious War Leader: I was thinking about making a Rush to Charge minion for a while now, but I really couldn't find how it worked. 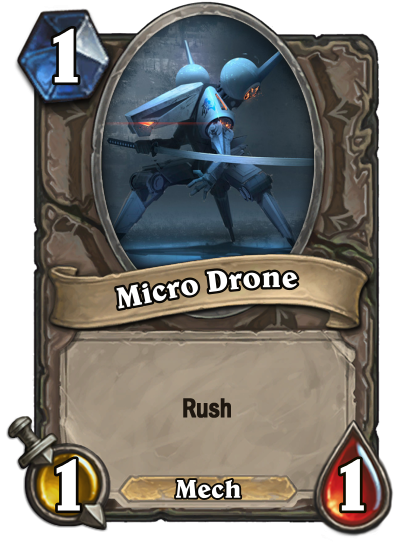 Originally this card was going to be "your Rush minions have Charge", but that would've been too strong in my opinion. 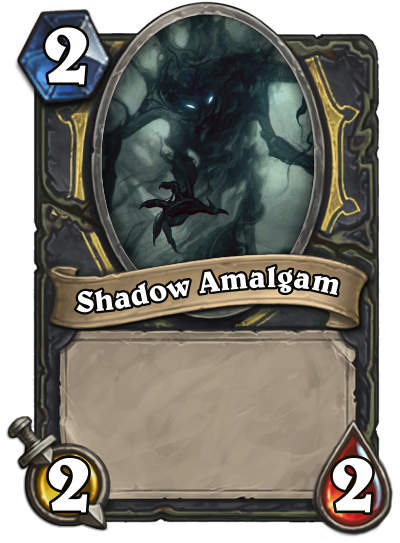 I feel like the singular target means that it can be combo'd with other minions to finish your opponent when necessary. That's all for this update, I might balance some cards after the next update, so please keep watch. (Don't worry, next update's gonna be a normal one :]) Date will be announced in the future! 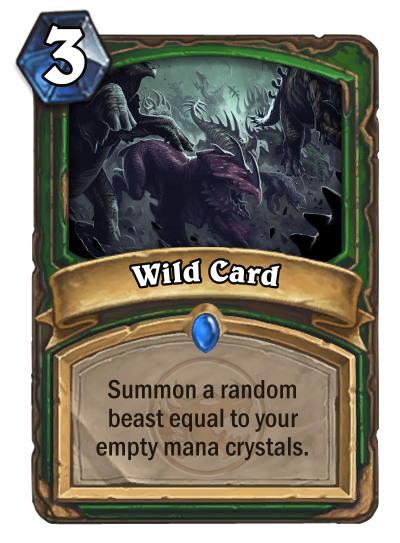 Wild Card: It's pretty simple, however flexible, and can pretty much be used at any point of the game. I decided to go with empty mana crystals because that makes the highest cost beast you can get 7 mana, which makes the opportunity for a free King Krush or something impossible. 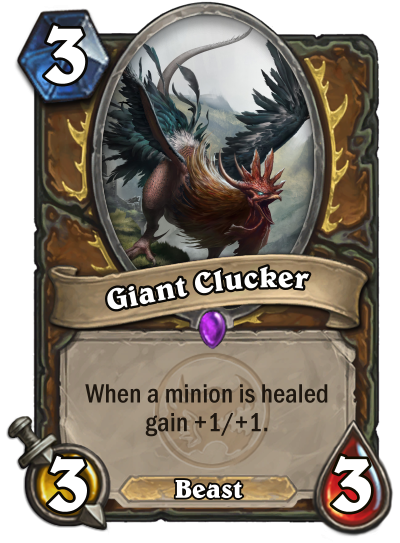 Giant Clucker: I wanted druid to focus on healing and beast mechanics, so i thought that the Giant Clucker fits into both categories, being a beast and having a trigger effect with healing. 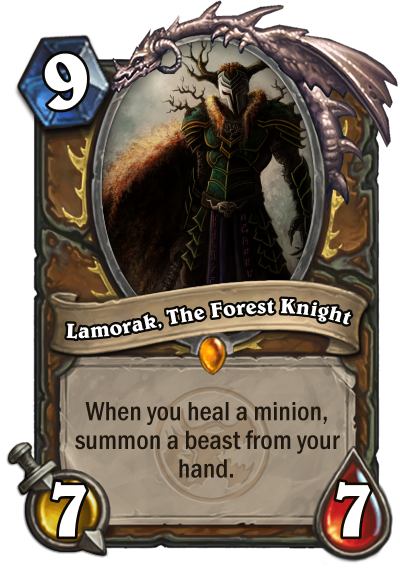 Lamorak, The Forest Knight: Lamorak's trigger effect also fits into both healing and beast mechanics, however, I think this card is much more of a stronger board presence, it works well as a pseudo taunt minion, and would be essential to most beast druid decks. 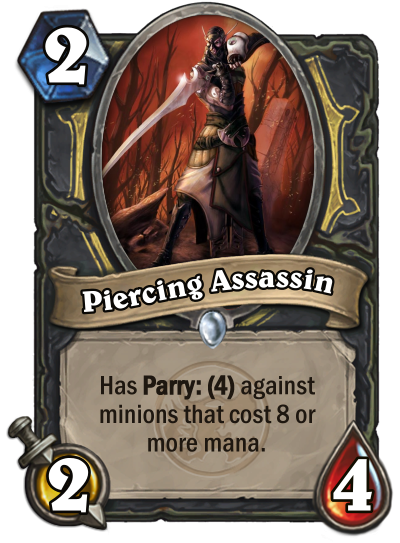 Piercing Assassin: Simple, good early board minion pretty good at taking down high-cost minions, especially with some buffs on it. 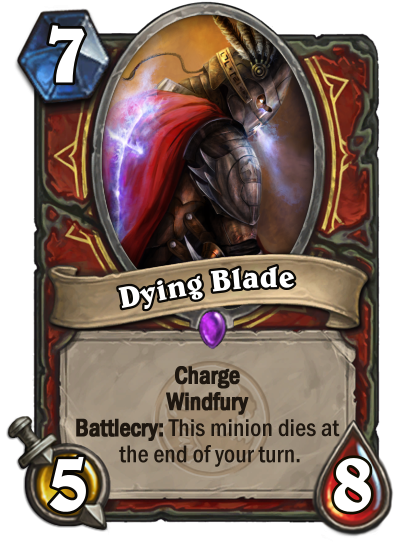 Dying Blade: I really like the feel of this card, a 10 damage burst that is only present on one turn. Technically it is a Pyroblast, however, the fact that the minion can die after only 5 damage output made me consider lowering the cost rather than having it at 10 mana. 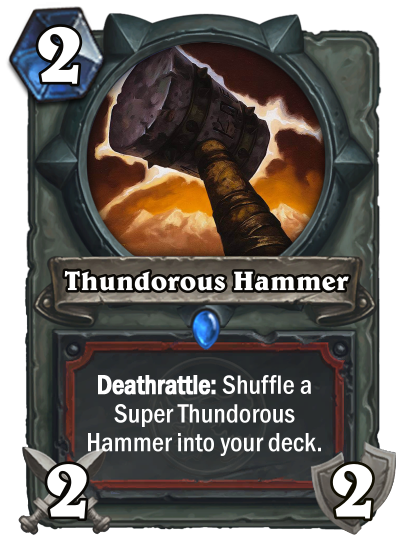 Thundorous Hammer: The token that this hammer provides isn't too overpowered, but pretty good considering, in most scenarios, its a free 2/4 weapon. 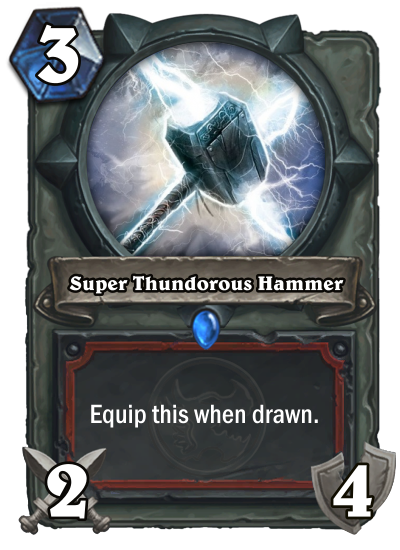 The weapon itself I feel is all right, since 4 damage for 2 mana doesn't really feel that overpowered. 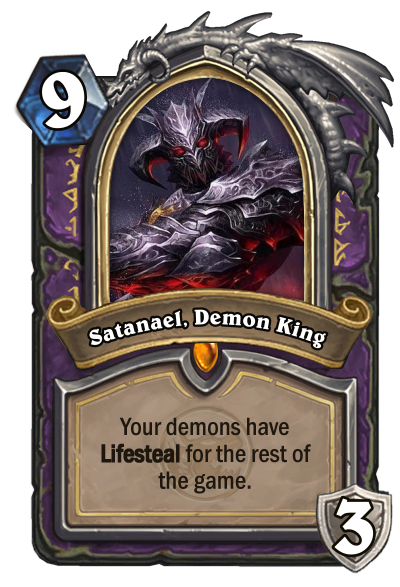 Satanael, Demon King: Finally a new hero card! Satanael is the hero legendary for warlock, and I had to consider it's ability quite a bit. I feel like where it's at now it isn't game breaking, but it is still good enough to play. His hero power, Blood Sword, makes it that he doesn't become vulnerable during the late game. Totally didn't steal the name from Persona 5 I swear. 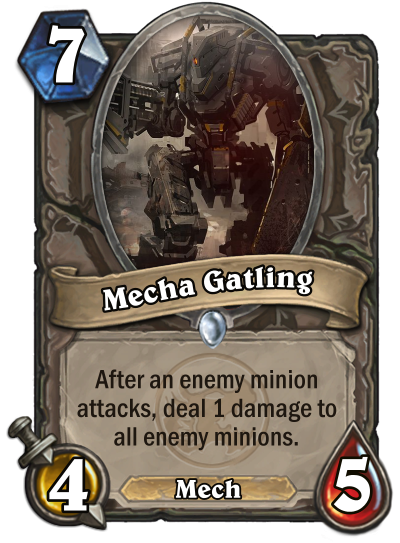 Mecha Gatling: Pretty simple mechanic, similar to the mech that deals 1 damage at the end of your turn, however only affects your opponent which makes it a much bigger threat. 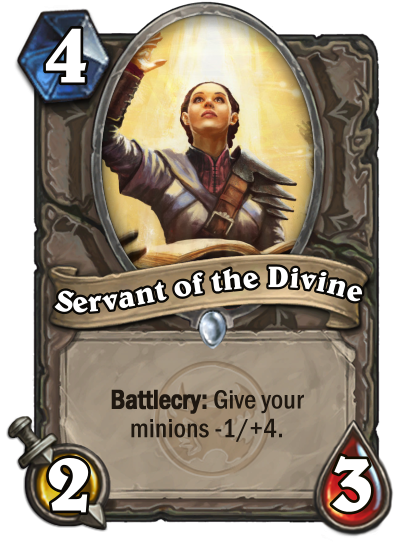 Servant of the Divine: Good survivability card, really useful with bigger minions that already have high attack stats and only need to rely on health, can pair with the Ragers or even a tanky card just to make it more tankier. That's all for this week! A Patch will happen before next card reveal. The first patch, many more will come when I feel like some cards need a little change. Why: I felt like 8 mana was a bit much for two animal companions, and I know To My Side! 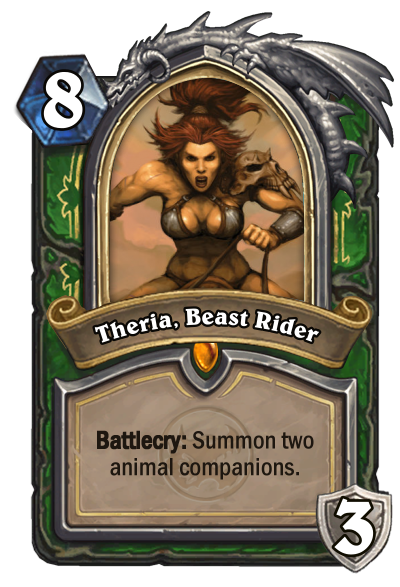 was 6 mana with a drawback, however, the cost of an animal companion is worth 3 mana. 5 armor is worth around 1 mana, so I felt 8 mana was a bit high for only 3 armor and two minions that cause some shift. You can even consider the hero power to be a handicap if the situations change. Why: I felt like the stats were way too low for dealing 6 damage, so instead of just making this a deal 6 damage, I thought it would be more interesting if this card gave a fireball to be used later in different strategies. Why: I decided to go a different direction with this minion. (credit to King Sevault) I was thinking about it, and normally whenever a hero is under five health, it usually means your opponent has either done their win condition or is running out of resources. So instead of it being a comeback method, usually winning you the game I decided to introduce Heal Priest since it activates once you heal an absurd amount of health. 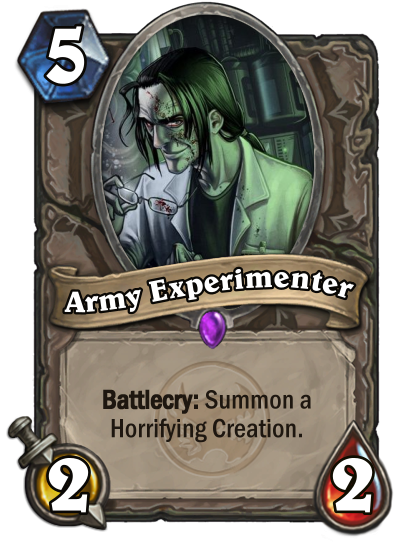 I feel like this would be so much interesting rather than a card that just isn't fun. Why: I liked the idea of this card, but it did feel a little strong a few hours after I uploaded, so this was my on the top on my list lol. The discard mechanic handicaps Warlock cards, making this card worth the boost. 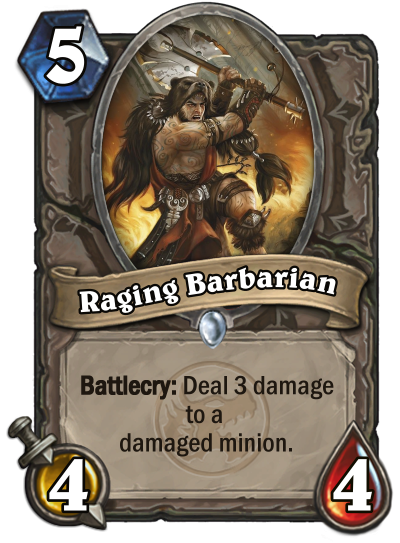 Why: I feel like the 3 damaged wasn't really good pay off, so instead, I made it deal 2 damaged except it may affect your own minions too which I feel is a good trade-off. Why: Similar to Deviant Demonology, this was on the top of my list to change. I felt like a potential 5+ Spell Damage was way too much for 6 mana, and at Malygos' cost of 9 mana increasing this minion to 8 makes sense cuz of the chance it doesn't get a lot of Spell Damage off. Thanks man! More coming Friday! New algorithm, instead of splitting them between Class cards and Neutral cards, I'll split them between card Rarity. 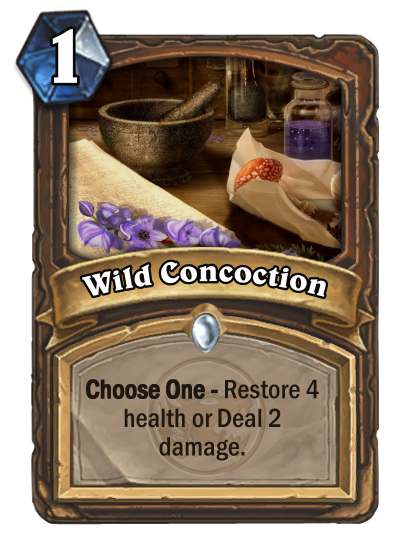 Wild Concoction- Card that utilizes druid's choose one mechanic, and focusing on the healing theme for the class. 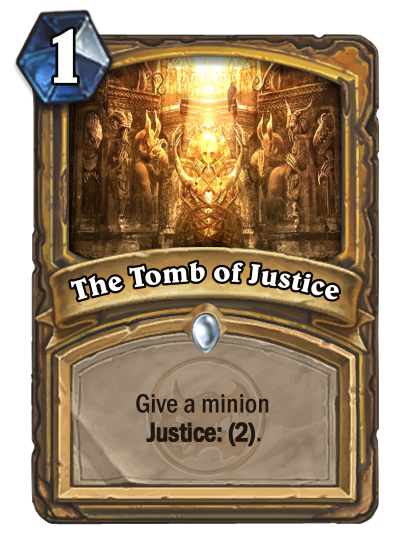 The Tomb of Justice- Introduces the new Justice mechanic in a mild way. 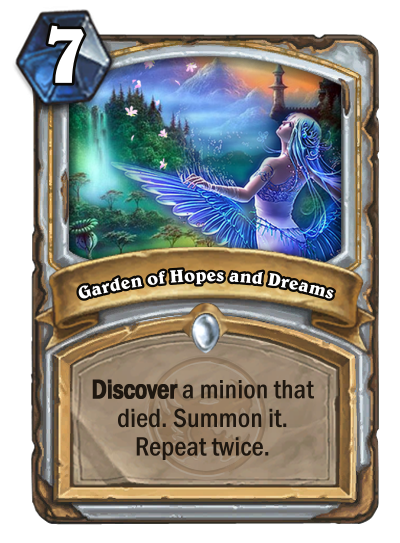 Garden of Hopes and Dreams- Like an amalgam of Diamond Spellstone and [cardFree from Amber[/card], good at a quick board and tempo shifting in games. 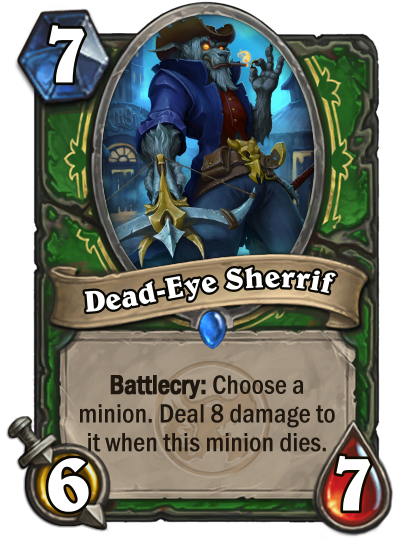 Dead-Eye Sherrif- Different way of removal, which can really change how your opponent decides to attack. Just as a disclaimer, your opponent does not see the minion you choose, which makes for some predictability chances and finesse. 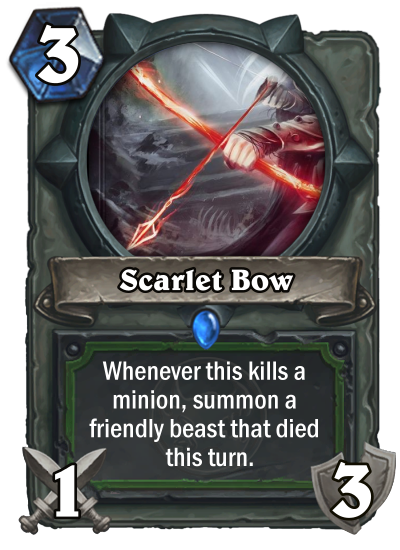 Scarlet Bow- Utilizes the revival mechanic, even though the stat line is pretty bad for a 3 mana weapon, its really good at keeping board presence throughout the game, with the ability of trading with little to no downside. 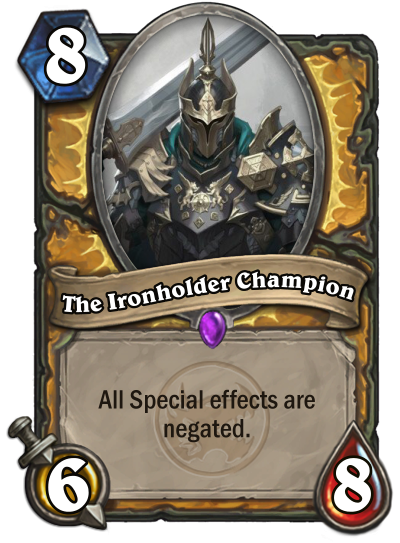 The Ironholder Champion- Good at stalling games and boards, even though it affects your minions to its also a pseudo taunt. Your opponent might want to target it first so that they get their Special effects back. 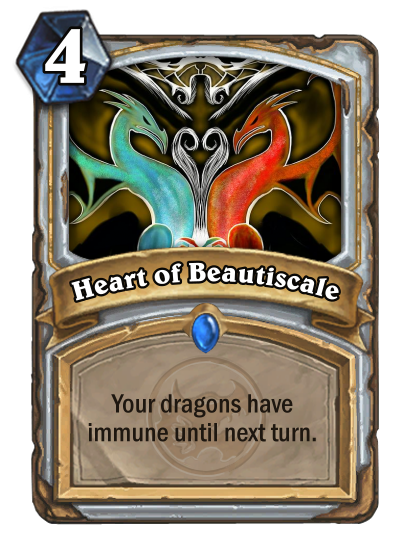 (Special effects include: Windfury, Taunt, Lifesteal, Recruit, Rush, Charge, Divine Shield, Stealth, Poisonous, Inspire, Spell Damage- Does not affect trigger effects like Battlecry, Deathrattle Choose one or Non-Specific Special Text.) Just as a fyi, if a minion has been previously silenced, lost their Divine Shield or Stealth when this minion dies, they will not recover their Divine Shield, Stealth or become unsilenced. 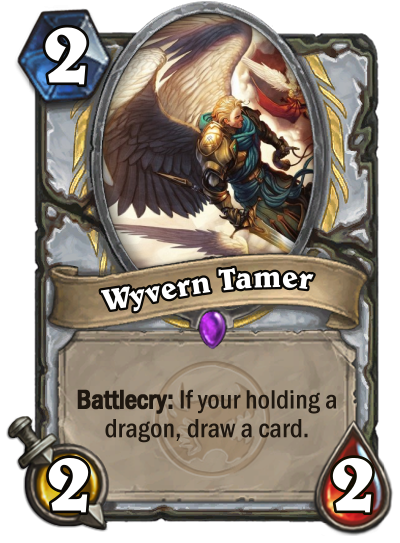 Wyvern Tamer- Good tempo curve, affects the early game advantage and fits generally really well in dragon-type priest decks. The card draw may provide an advantage, along with the body. This card is basically an all-around good choice if you have the right archetype. 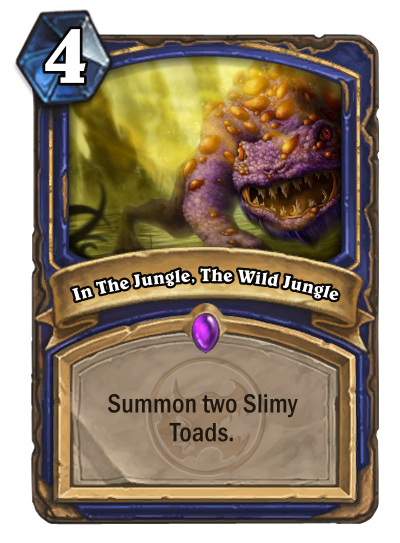 In the Jungle, The Wild Jungle- A slow-paced removal, summoning two poisonous minions that can really shake things up if they aren't dealt with immediately. 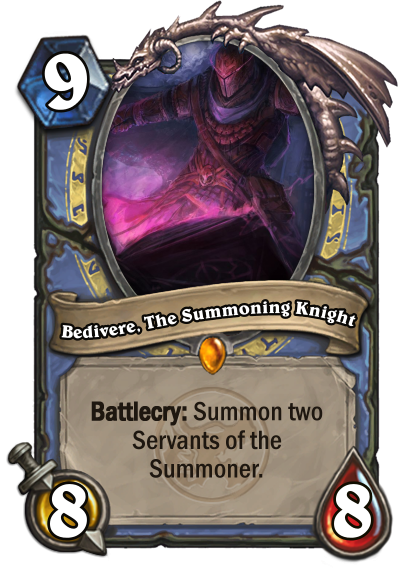 Bedivere, The Summoning Knight: A late game card, Bedivere provides two minions with higher than average health stats for their mana, and can potentially deal a crazy output of damage from the spell damage increase. Even his own stat lines aren't that bad, and can really cause some disruption. 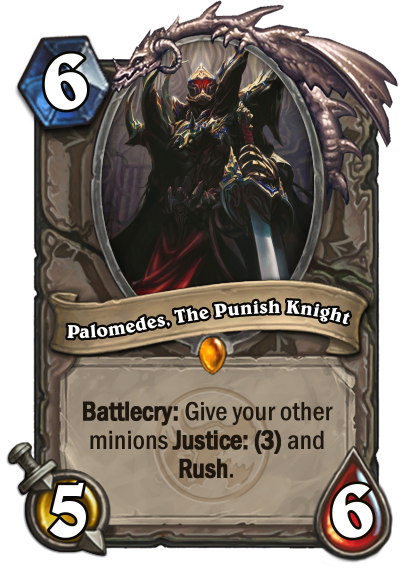 Palomedes, The Punish Knight: The opposite of Percival, a really easy card to make a big board incredibly scary. 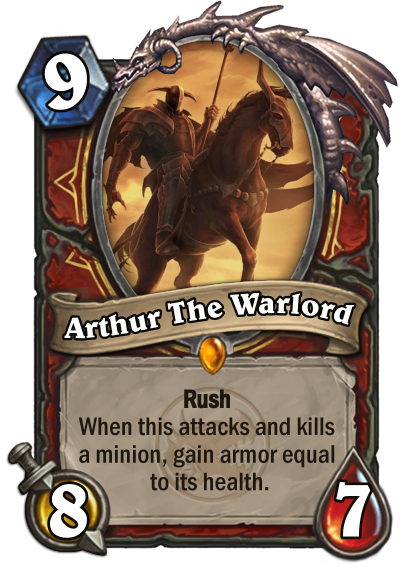 Especially with the potential stat buff of +3 attack from Justice, the Rush opens up for a potential board clear. Thats it this time! I'm not gonna post an update next week because of March Break, so it might be a minute before I announce the next update. Thanks for the support, I'm really enjoying making this set! 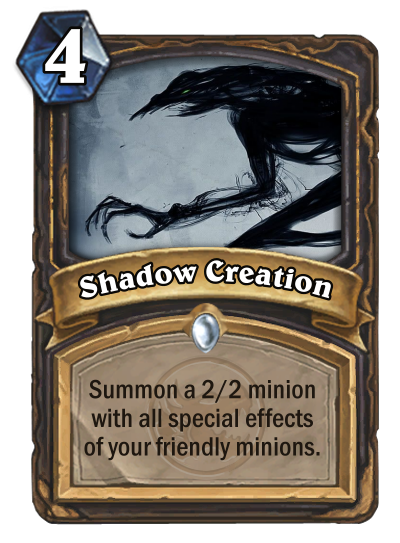 Shadow Creation- This card basically gives you the value of your minions in one. 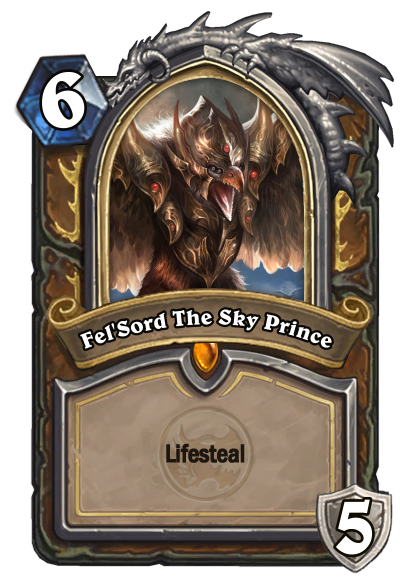 By special effects, I mean effects such as Lifesteal, Divine Shield or the original Justice/Parry mechanic. I feel like it's balanced with the higher mana cost, and even though it can become heavily stacked the requirement is pretty big fora 4 mana spell, and the minion has an overall lower statline. 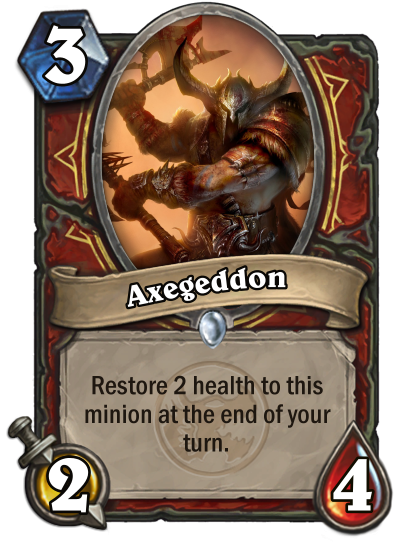 Axegeddon- Really good at keeping its presence on the board, with its self-restoration option making it most the times a card your opponent has to deal with in a single turn. 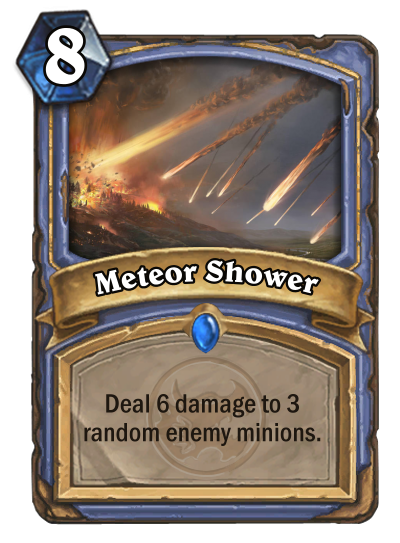 Meteor Shower- I was considering a few bases when coming up with the numbers. Fireball, Flamestrike and Meteor is mostly what I considered. 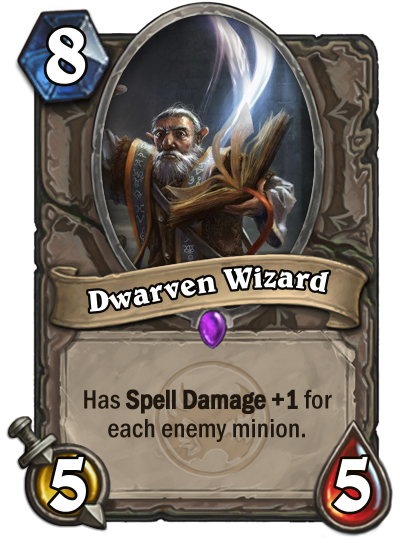 I decided 6 damage 3 times for 8 mana is a good statline, for it not being targetable and not being able to hit face balances out the high mana cost and damage. 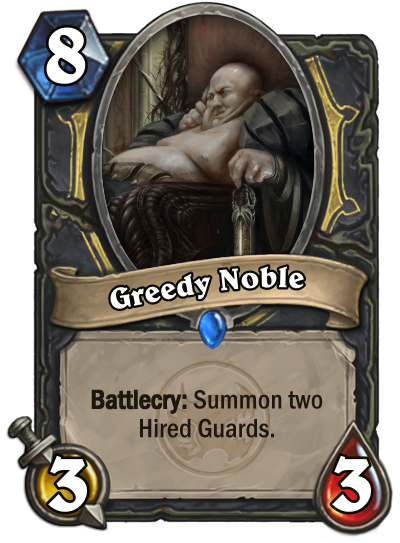 Greedy Noble- Similar to Giggling Inventor, except with bigger minions and no divine shield. Really simple stall card, and can see play with its 8 mana 8/12 in three bodies statline. Toxizard- Synergy with previously revealed Degore, The Corrupt Knight giving you a poisonous minion and extra draw. More synergy for Degore will come soon! 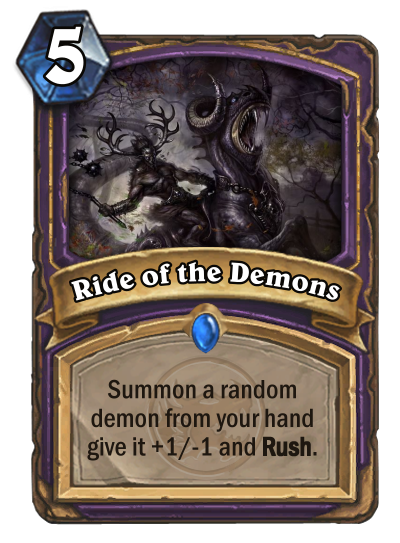 Ride of the Demons- I was considering recently revealed Stampeding Roar when making this card, and the 5 mana summon is balanced in my opinion with the 1 less health point, and 1 extra attack this makes the demon usually a quick outburst of damage. Deathstroker- A two in one, a quick 4 damage and a nice silence against other minions. 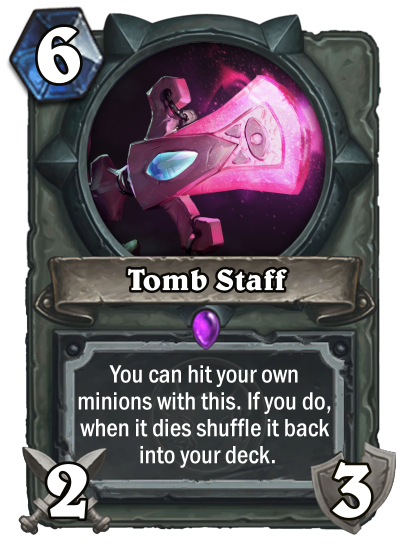 Tomb Staff- Priest's weapon, featuring a new option of hitting your own minions. 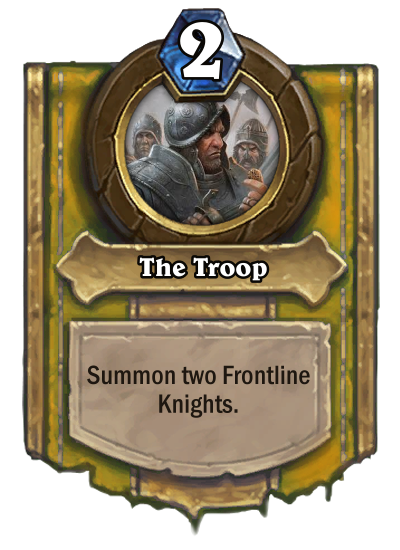 I feel like this is situational because maybe you would want to keep a card in your deck or get rid of an enemy minion, so its pretty optional. 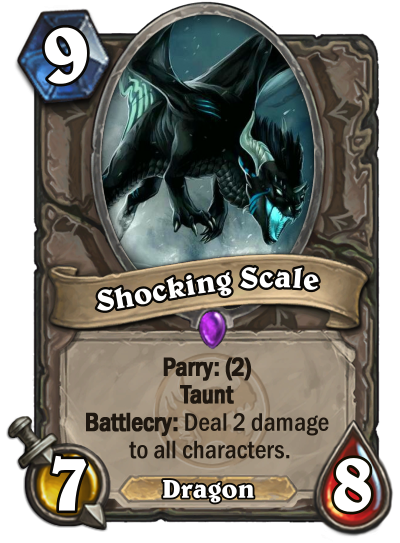 Shocking Scale- Including the baron geddon effect and parry, This card is a real big taunt minion and a threatening one too that your opponent will try and clear immediately. 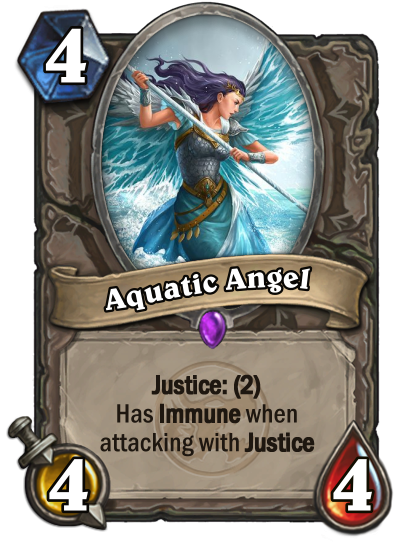 Aquatic Angel- Basically meaning, this is a great punish tech against minions who've killed one of your minions. The justice might be hard to trigger, but when it is this minion is basically a free 4 damage. 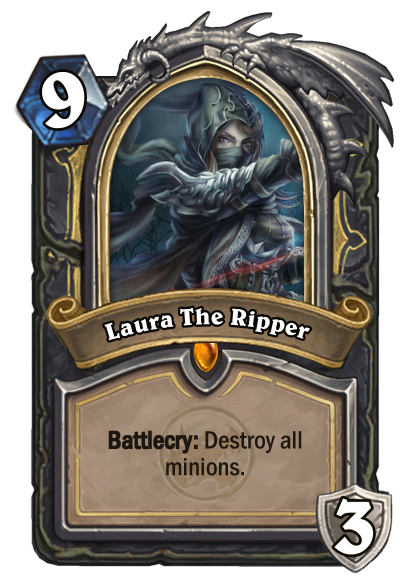 Laura The Ripper: One of the descendants of famed serial killer Jack The Ripper, this hero card is really good at tempo swinging, being able to get an easy board clear on play, cleaning up situation. 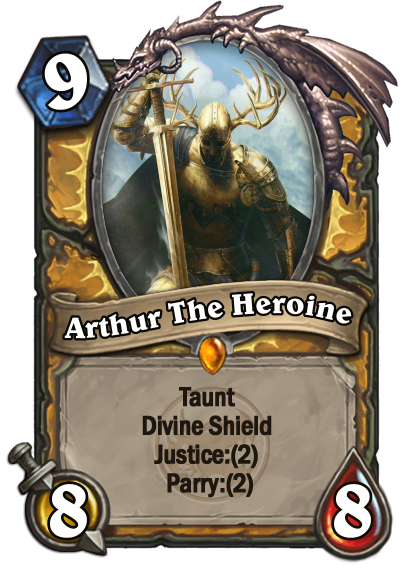 Her hero power is easy, however, since its guaranteed an end of turn effect, it can be used in some gimmicky ways to potentially get more value. I really like the feel of, "cut literally everything" this card has and enjoyed making it. That's all for this week, in a little bit I'll post a poll for people to vote their favorites, but for now, I'll be going! Next update will be on Saturday, March 30th. Deleted the polls, as requested. 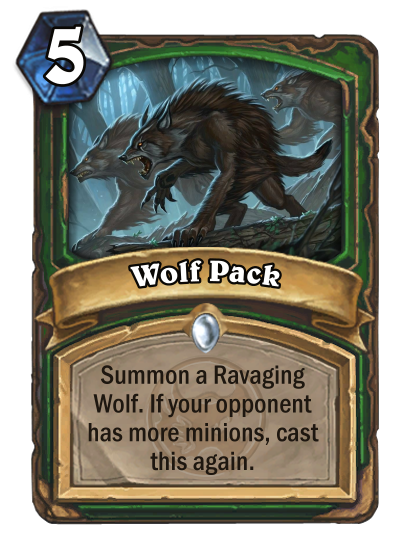 Wolf Pack- Similar to the *shudder* Spreading Plague card of druid, it creates a bunch of minions depending on your opponent's board status. 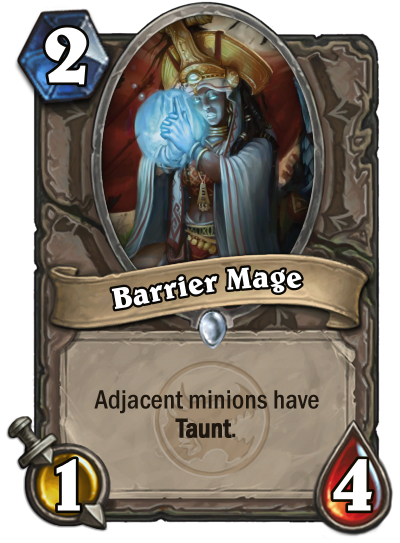 However, I believe this is more balanced than Plague because it doesn't create a wall that stalls for time and is just a pain to deal with, it's more of an AoE clear giving more damage the bigger the threat. 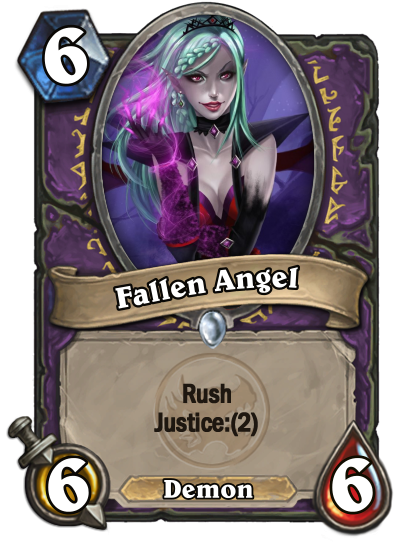 Fallen Angel- Not too much to say about this card other than it's justice and Rush synergy creates an opportunity to clear a minion from the board. 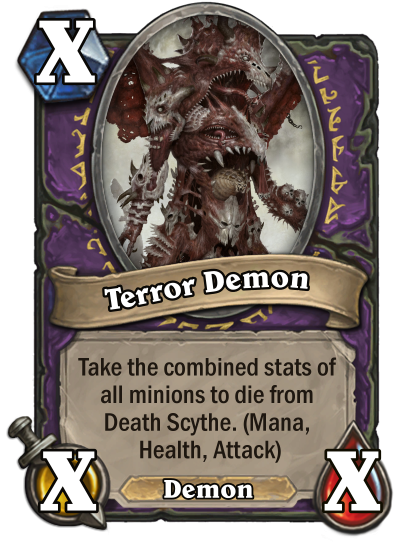 It's also a demon, so the synergy is there. Poisloc- A quick removal, or synergy in Murloc decks. 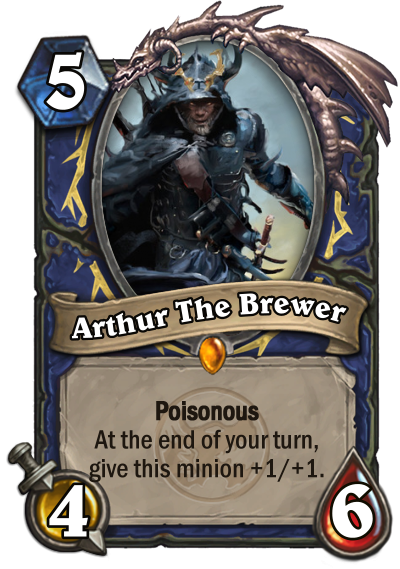 With the poisonous, it's good for taking out a minion and I feel like it's at a good cost point. 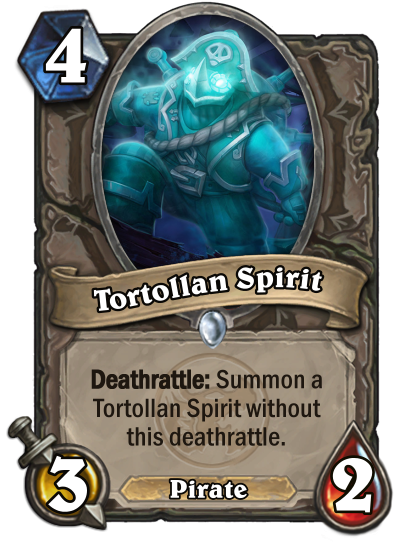 Tortollan Spirit- Similar to Saronite Chain Gang, except the difference is this is a death rattle rather than a battlecry. I feel like this card would open up for more aggressive plays, knowing that you'll get a free copy of it after the original dies. Barrier Mage- A good, quick, protection strategy mostly against aggro style decks. 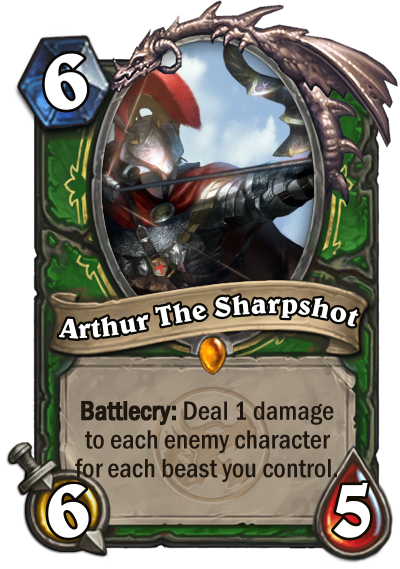 Even though it doesn't give the minions permanent taunt, at the right time it could really affect your opponents game plan heavily. 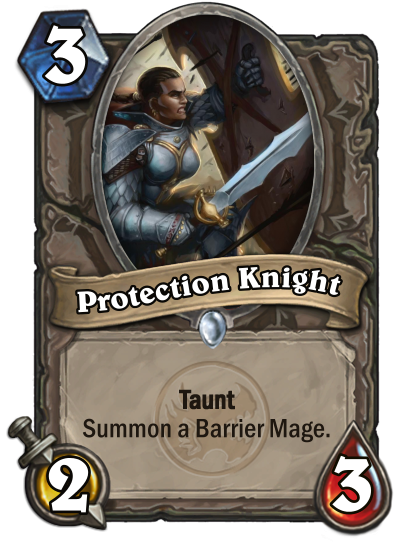 Protection Knight- A low-cost taunt minion, that summons previous card Barrier Mage, which basically makes this card a "summon a 1/4 and give another minion Taunt." good value card, and creates yourself a board that's good for holding time or just for Token. 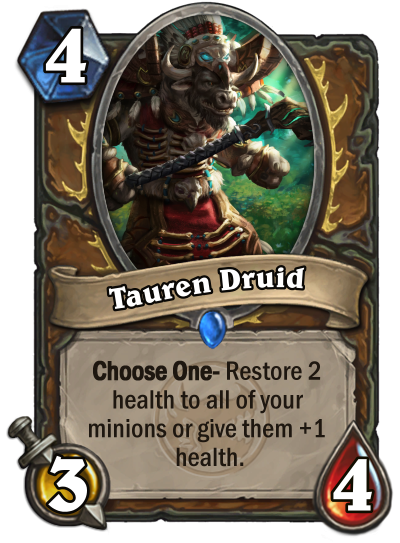 Tauren Druid- Fits into the healing druid archetype that I am going for in this set, however it does provide the option to make your other cards bulkier which could be a good choice during the situation. 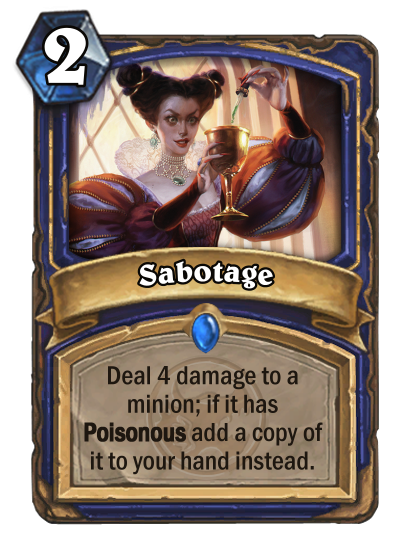 Sabotage- Sabotage can be used situationally to either deal damage to minions or get a copy of your Poisonous shaman minions, basically, it can help with board advantage or card advantage. You decide! 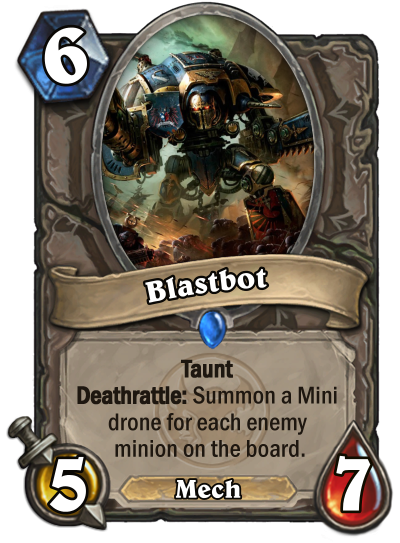 Blastbot- A good defensive card, that not only is a larger costing taunt minion, it's deathrattle can also help clear up the mess that it couldn't with the multitude of 1/1 rush mechs. 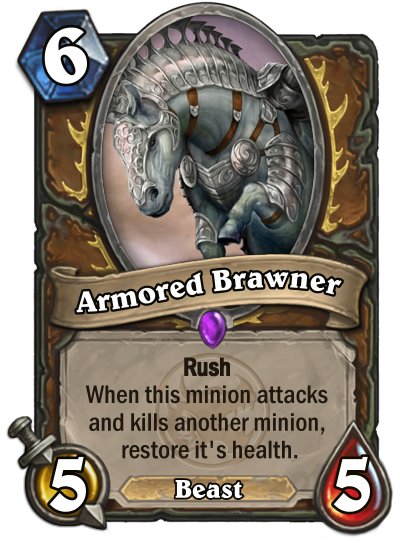 With the mech tag, it could fit into Mech Warrior or Mech Hunter type decks, but it's still an overall good defensive option. 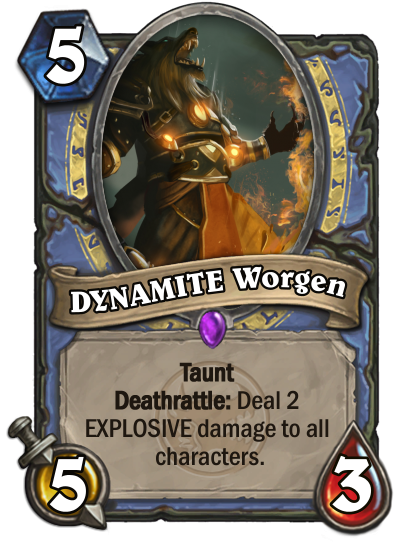 DYNAMITE Worgen- It's 5 damage outburst and deathrattle that's similar to Baron Geddon's ability can be a good board control play, clearing up minions that are a nuisance to the board quickly and efficiently. 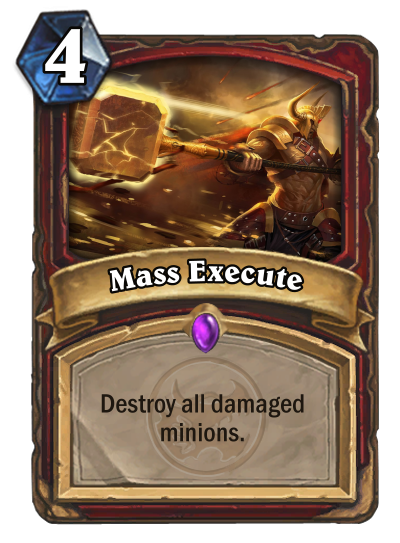 Mass Execute- A strong card that can really hit your opponent hard. The 4 mana cost is a good place for me because I feel like the normal Execute is about more than half the cost of a "destroy a minion" card. This card is half the cost of your average "destroy all minions card", because it can be really good or really bad. None the less, it still is effective in keeping the board in your favor. 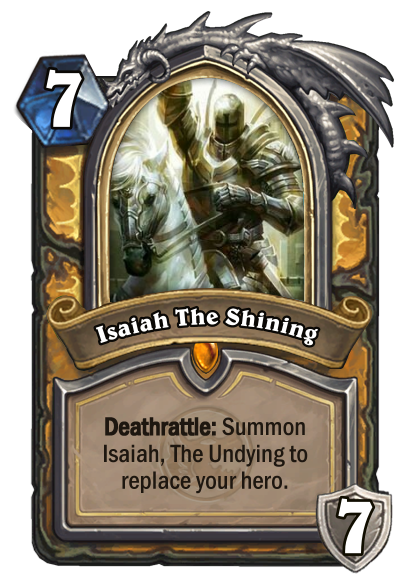 Isaiah, The Shining- The hero card for paladin, comes with a hefty amount of armor when played. 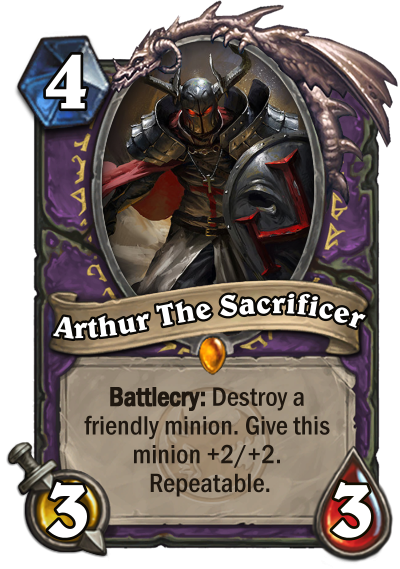 His hero power gives you a choice from three every turn, either you summon two 1/1 minions, gain 4 armor or give a minion +2/+2 which, in my opinion, is really good for the versitality of the power. 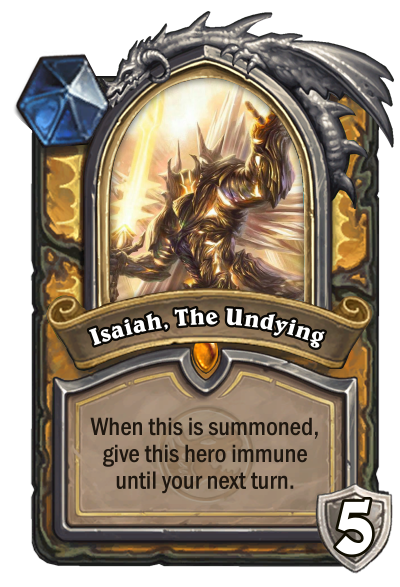 However, his deathrattle summons Isaiah The Undying, which unleashes his ULTIMATE form in battle, granting him immunity until his next turn and 5 additional armor. 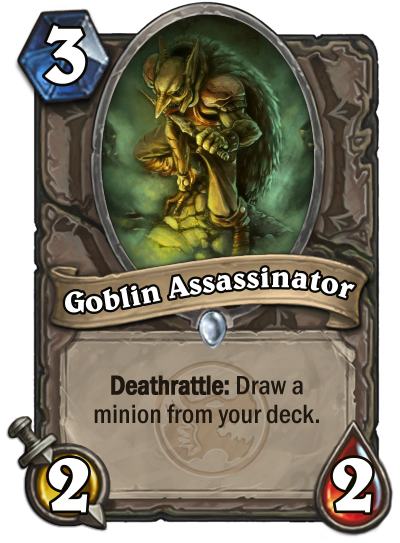 This deathrattle is crucial in helping with your gameplan, and can really be the factor of if you win or not. Thats all for today folks! Since next update is 2.0, it's going to introduce a VERY special hero of history! Coming Tuesday, April 2nd! 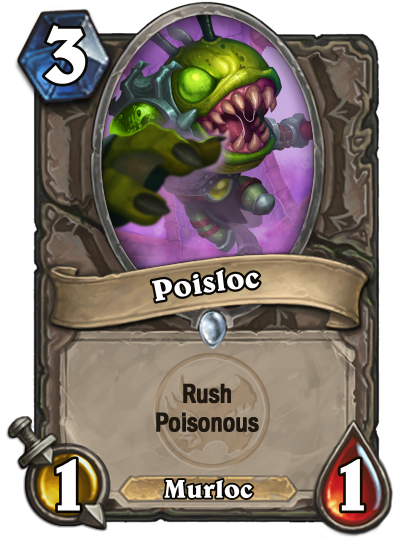 Poisloc: That is one potent source of removal, and probably why we've never seen a Rush Poisonous minion at such a low cost. Compare it to, say, Voodoo Doll or that Hunter-specific Vilebrood Skitterer. Both of these come with conditions (the first taking extra time/mana to activate its deathrattle and the other being a hunter-specific on top of having such a high mana cost). 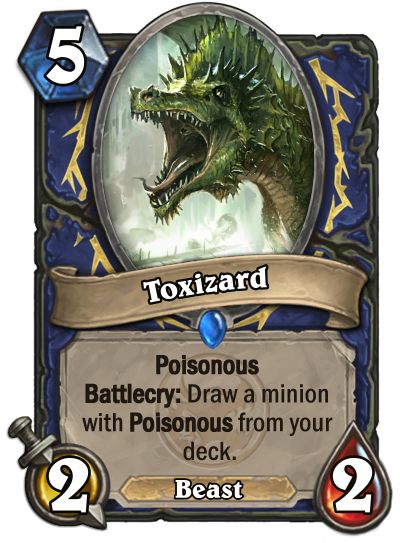 Even something like Toxmonger takes at least 5 mana to play and requires two cards to get a poisonous rush minion. 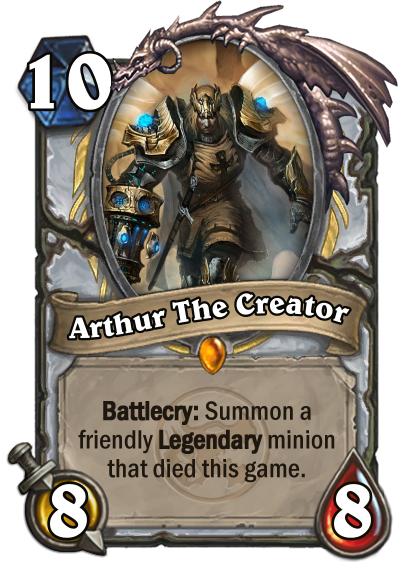 Simply put, this card is way too good for Hearthstone, especially since it's a neutral, and requires a nerf. Isaiah, The Shining: That is one powerful hero card, perhaps even on par with Bloodreaver Gul'dan, hailed as the most powerful hero card in Hearthstone. First, there is the 7 armor. 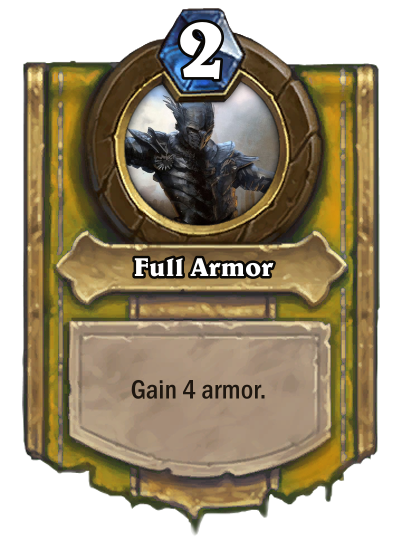 Why 7 armor? Just make it 5. Second, the deathrattle is essentially an Ice Block and Time Out!, AND, once triggered, provides access to a very powerful secondary hero. We've all seen Malfurion the Pestilent's power with his amazing versatility to see just how powerful versatility is. 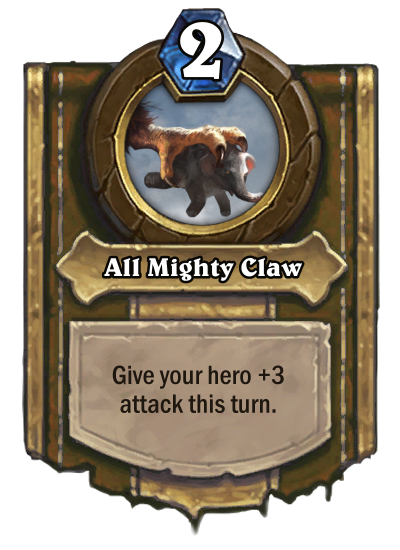 His hero power provides what is essentially The Silver Hand, Tank Up!, and Dinomancy for all minions. Three very powerful hero powers, and we can choose any of these at our leisure. 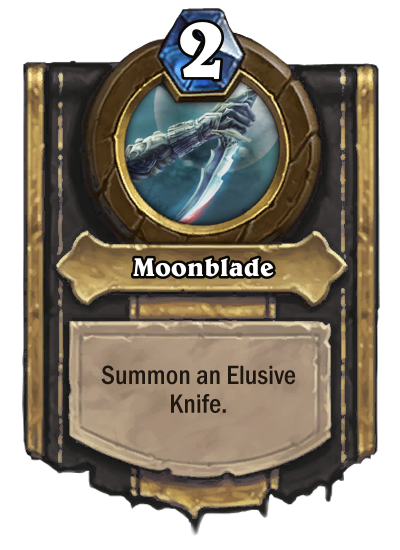 And finally, I'd like to point out a powerful combo this card can use. Specifically in Wild: Reno Jackson and/or Forbidden Healing. Just heal back up to full, and all's well and good. And YES, you CAN target Immune characters with healing abilities (I checked via the wiki). Tl;dr too powerful, may even be unsalvageable.